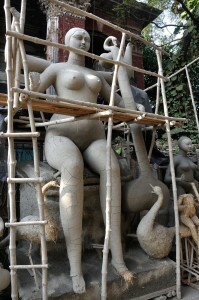 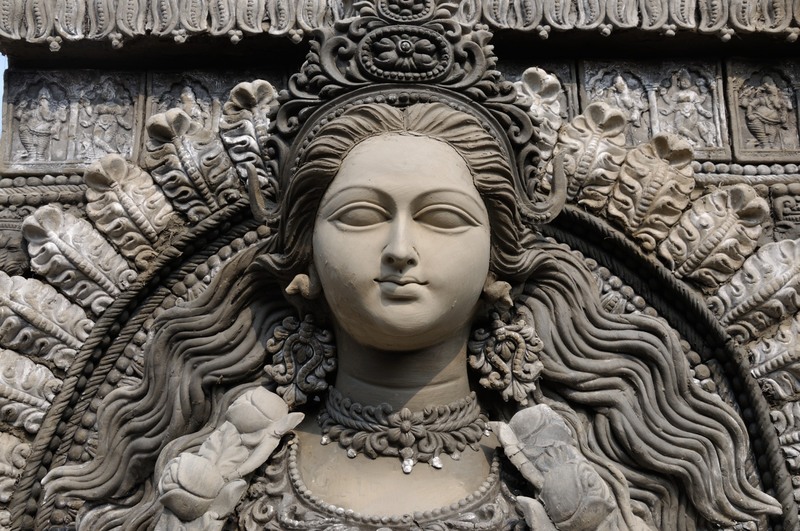 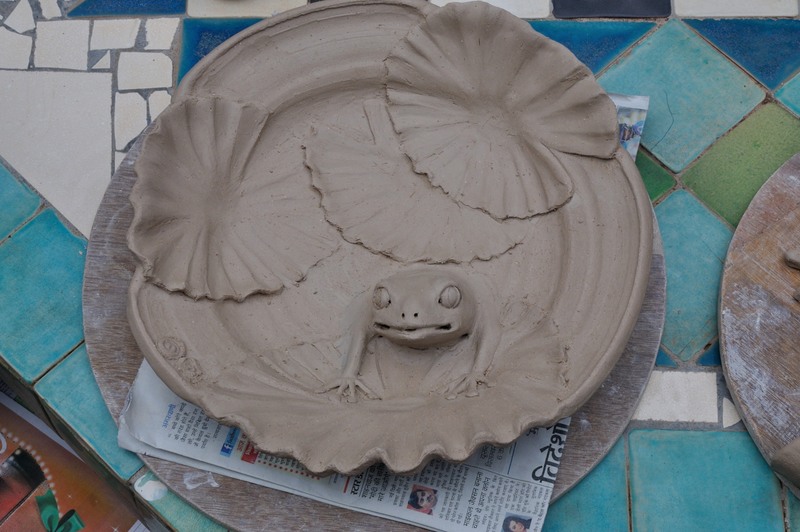 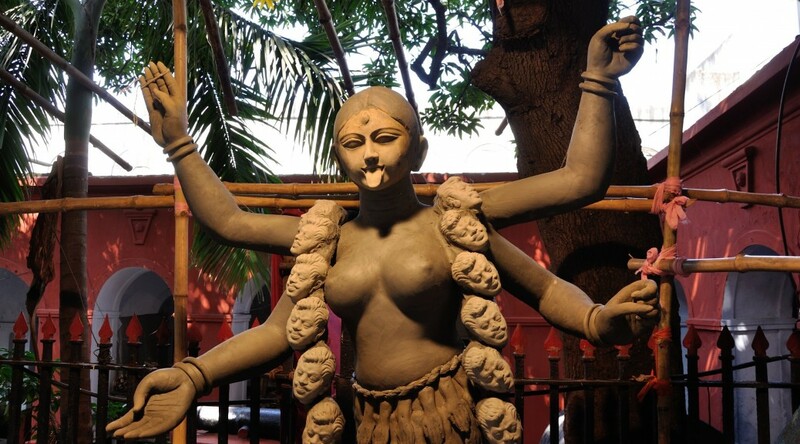 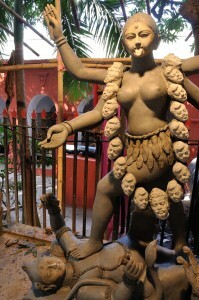 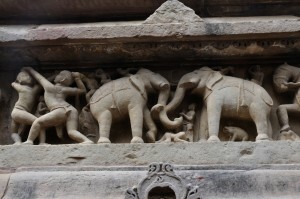 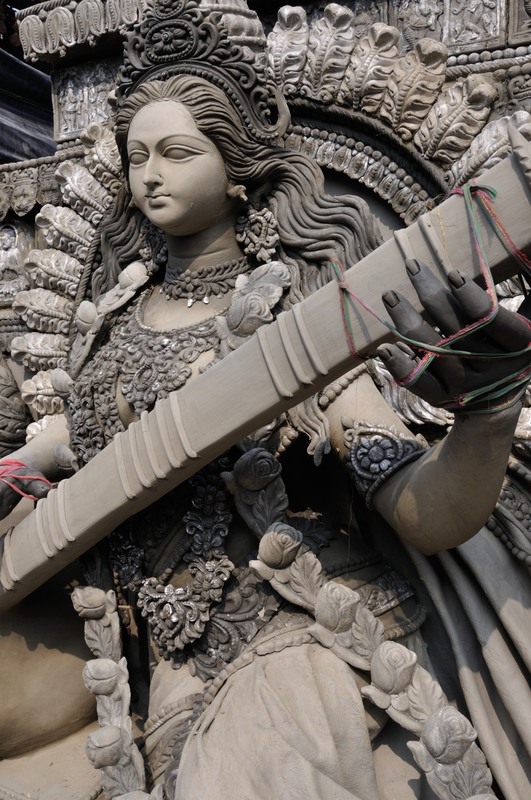 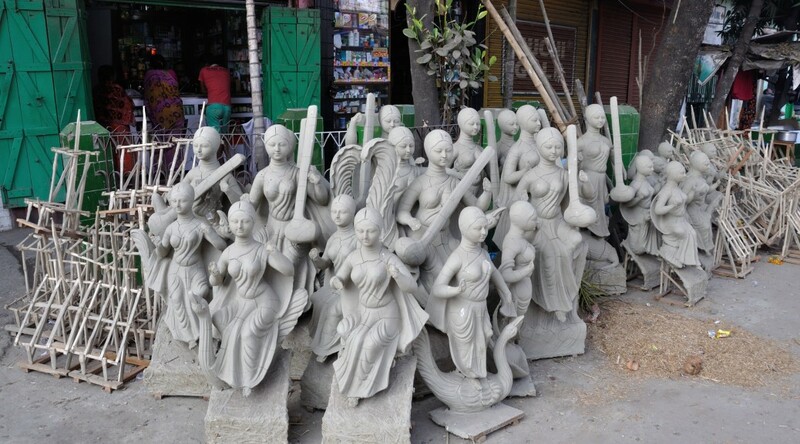 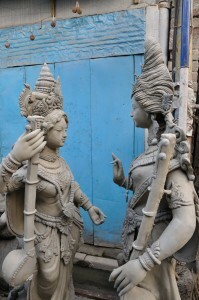 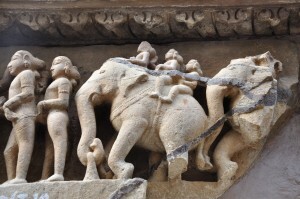 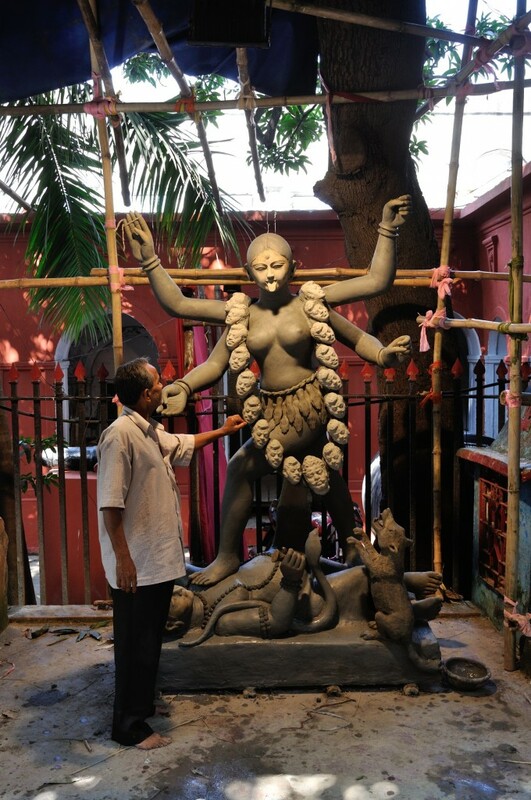 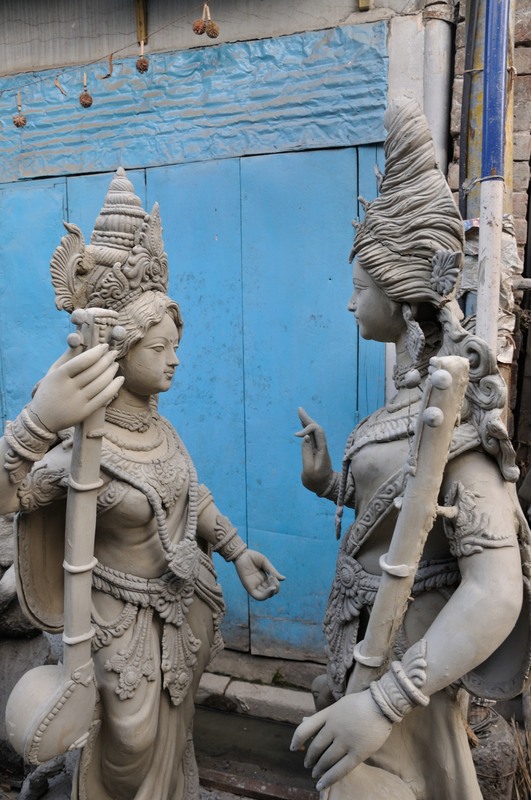 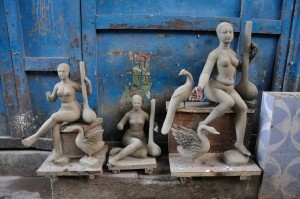 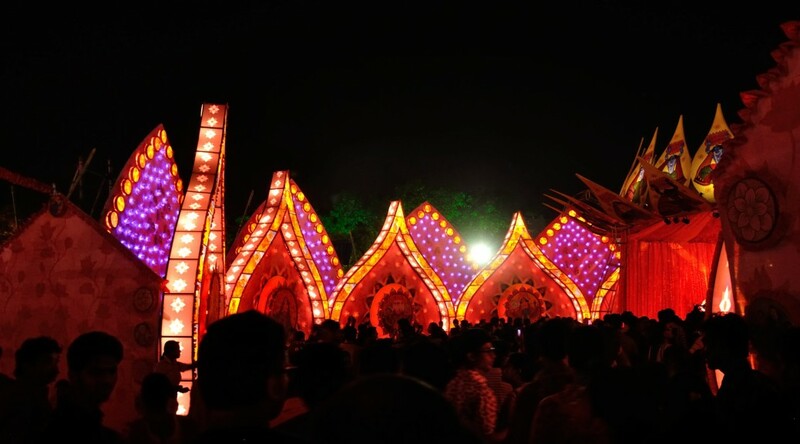 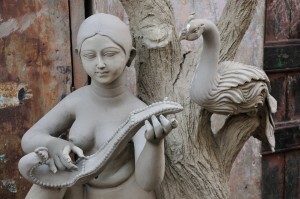 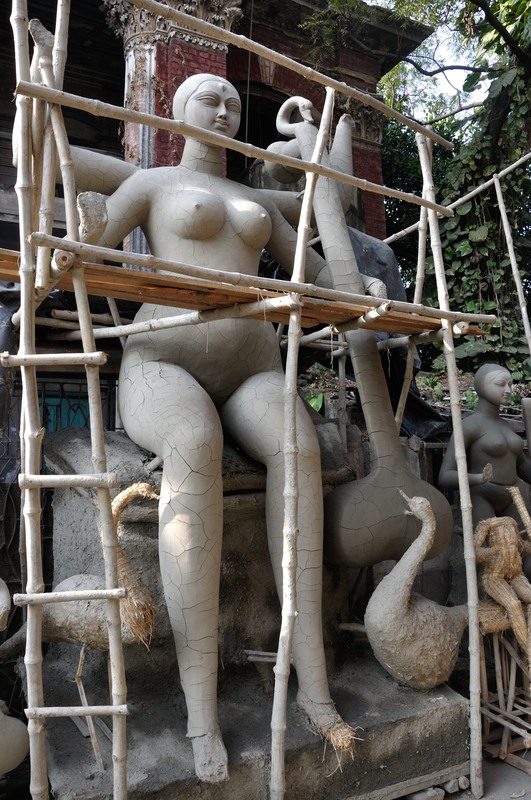 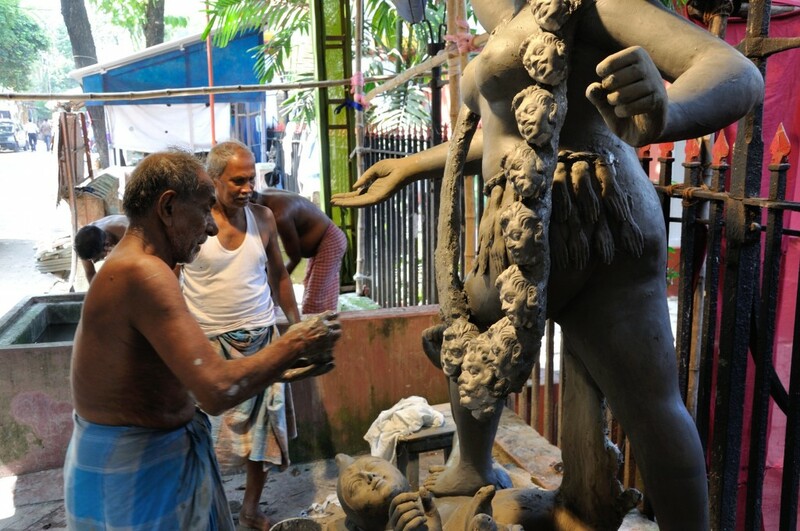 Please forgive me the transgression of diverting us from all things clay sculptural, and indulge me in a bit o’discourse regarding one of my favorite parts of Bengali culture – Mishty. 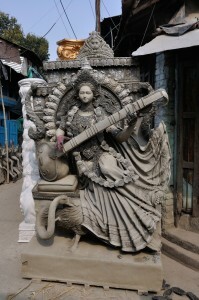 Mishty is the Bengali word for sweet and is also the word for a dizzying variety of sweet foods that are made with nuts and/or milk products combined with spices and other flavorings. 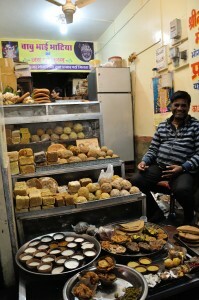 Mishty shops are everywhere in Kolkata, and are a cause for wonder— if one stops to think about the sheer output of sweets in relation to the number of people available to eat them! 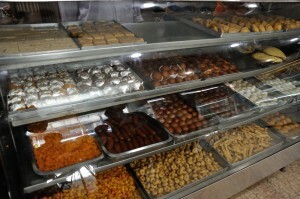 In any case, it’s not long into a conversation with a Bengali before they assert the superiority of Bengali sweets over all others. 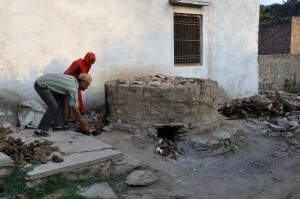 While I won’t comment any more about that, I will definitively say that mishty are delicious!! 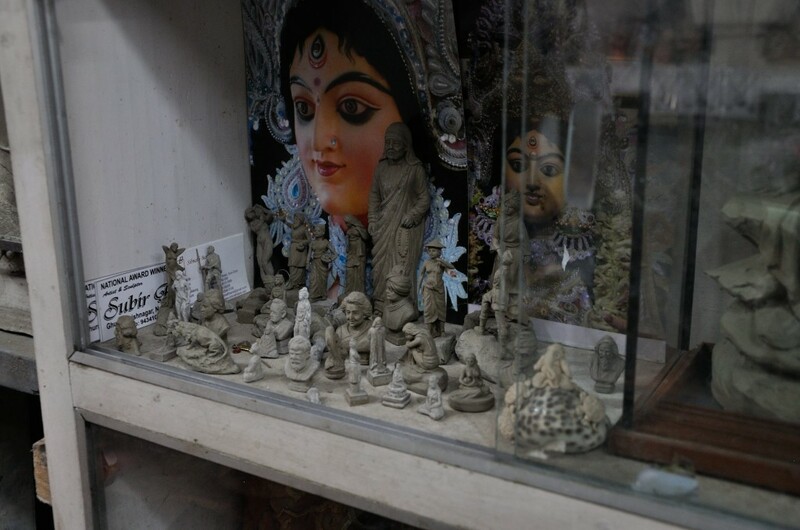 I favored one shop in particular, which was on the way to a studio where I worked occasionally. 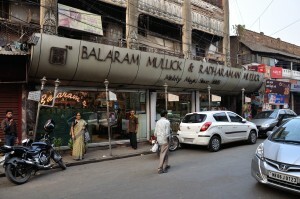 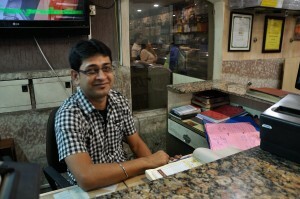 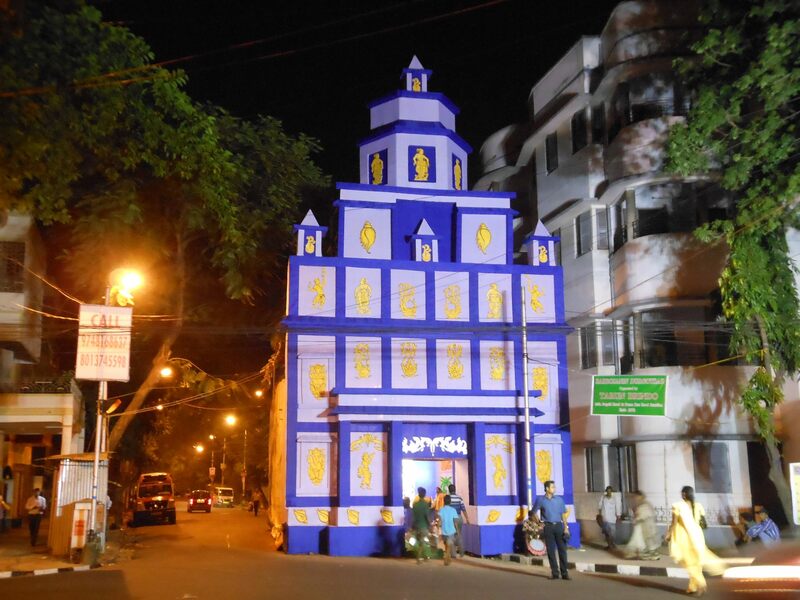 The name is Balaram and Mullick’s, as pictured below, at the Bhawanipore location where they have been in business since 1885. 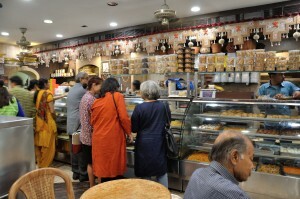 The store manager and great-grandson of the founder. 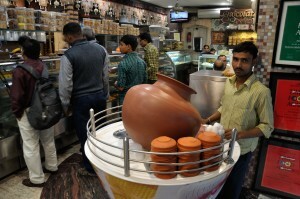 Fresh kulfi (ice cream) is served with a variety of toppings. 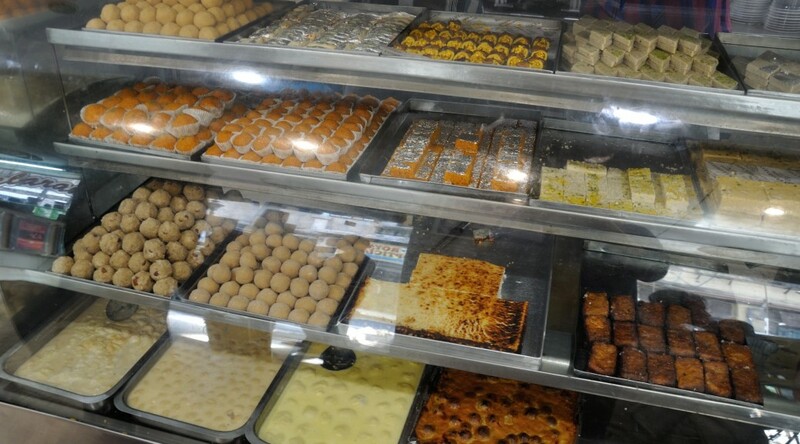 Rasgullah, sandesh, kheer, chamcham, chenna, chandra, kalakund, gulab jamun, ladoo —even in seven months of living here, I fear that there will not be enough time to try everything. 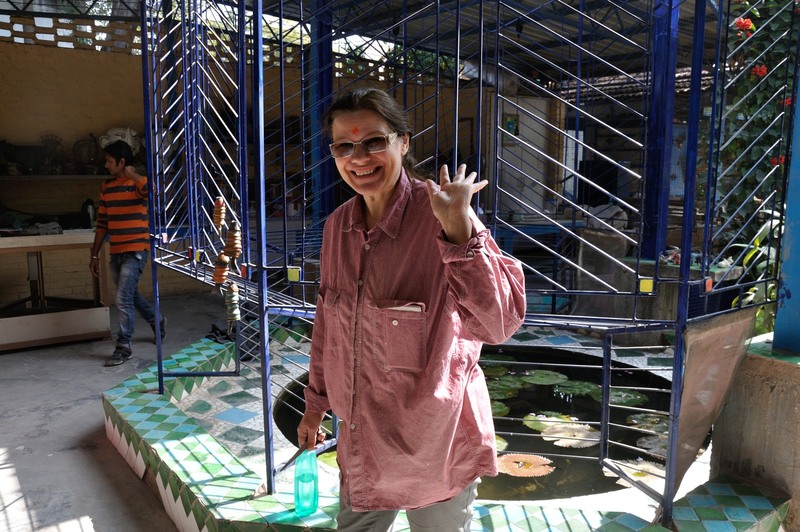 I have made a solemn promise to myself to learn to make the mishty doi (sweet yogurt) when I return to Santa Cruz. 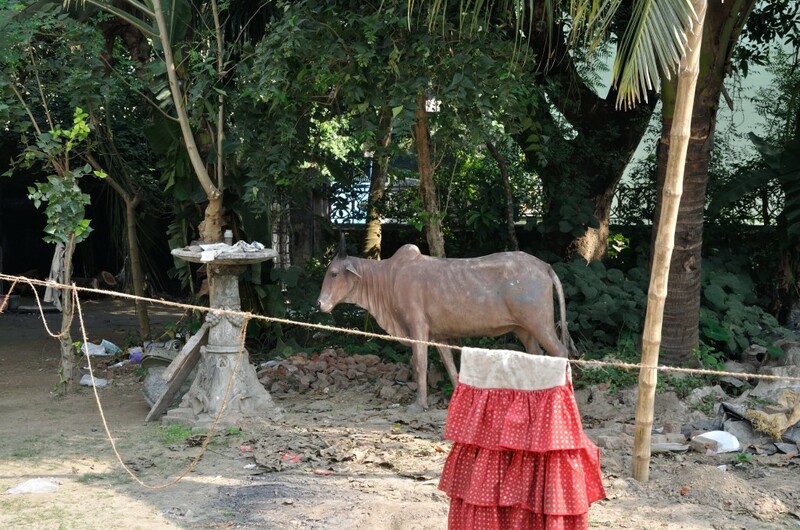 For the rest, I’ll just need to return to Kolkata! 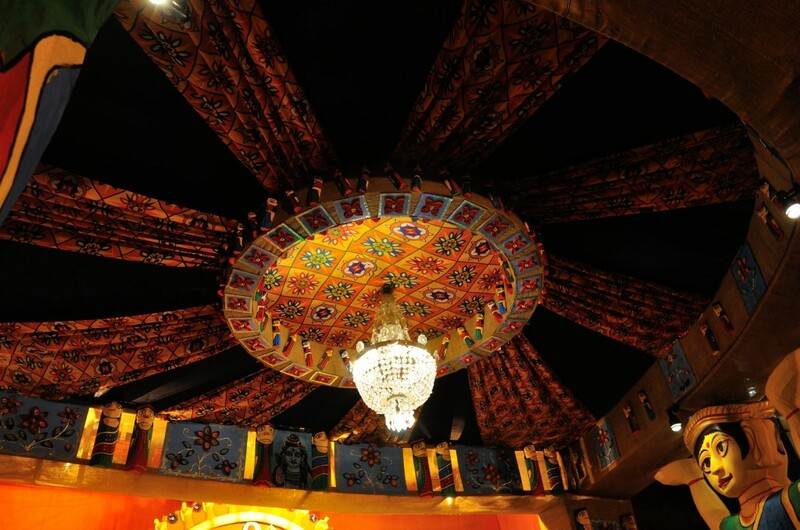 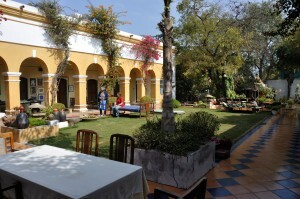 Say hello to one of my new favorite places —- Molela! 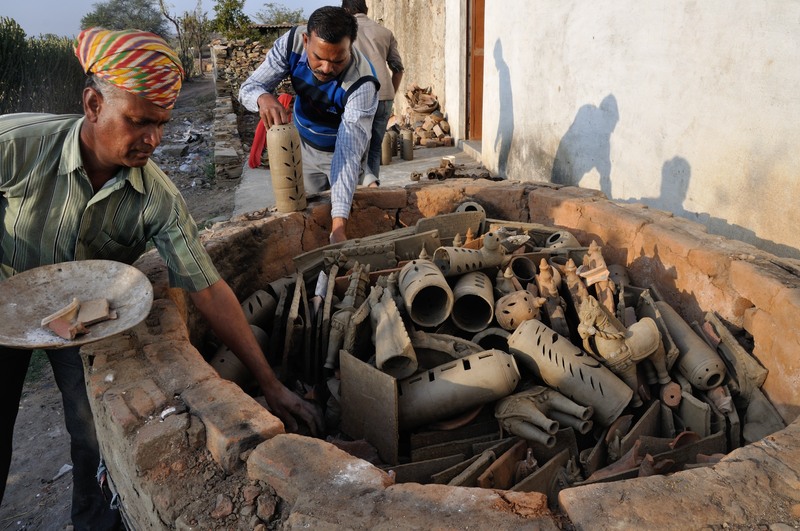 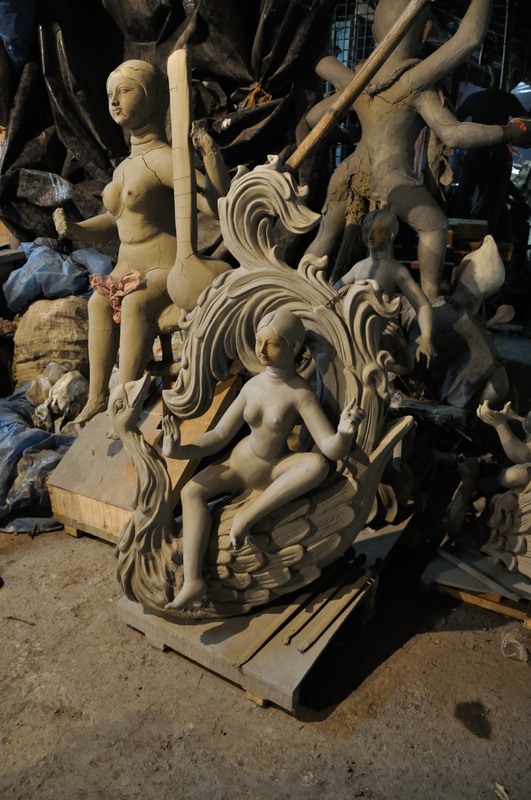 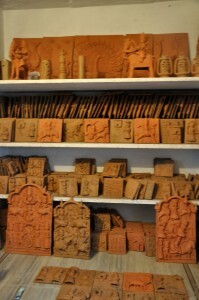 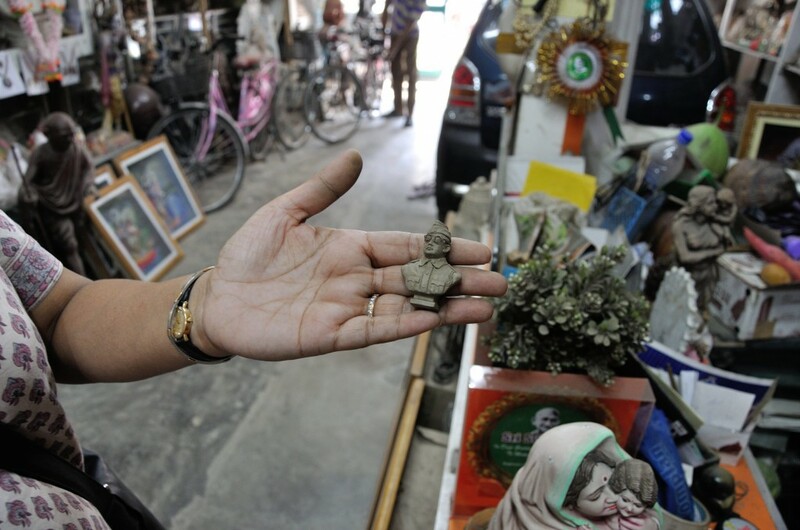 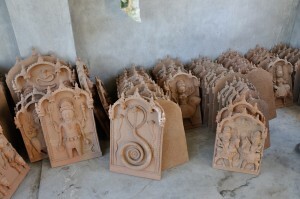 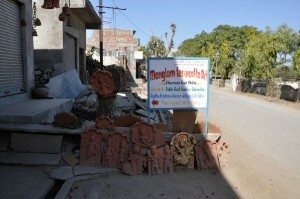 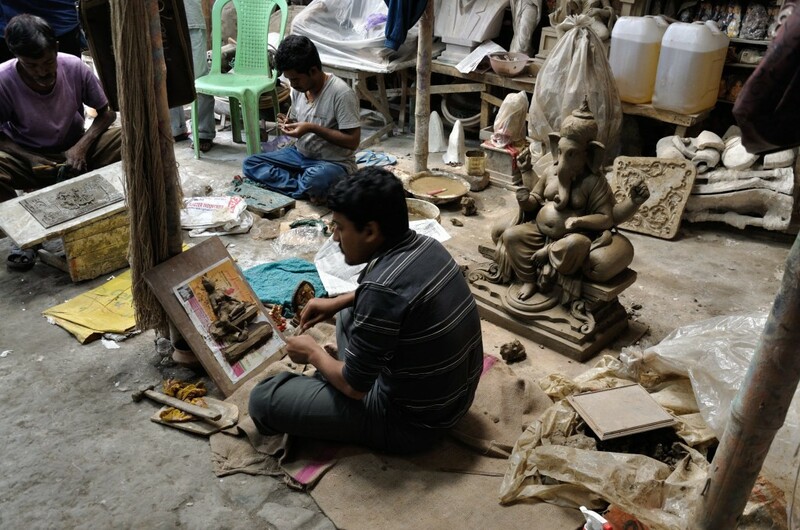 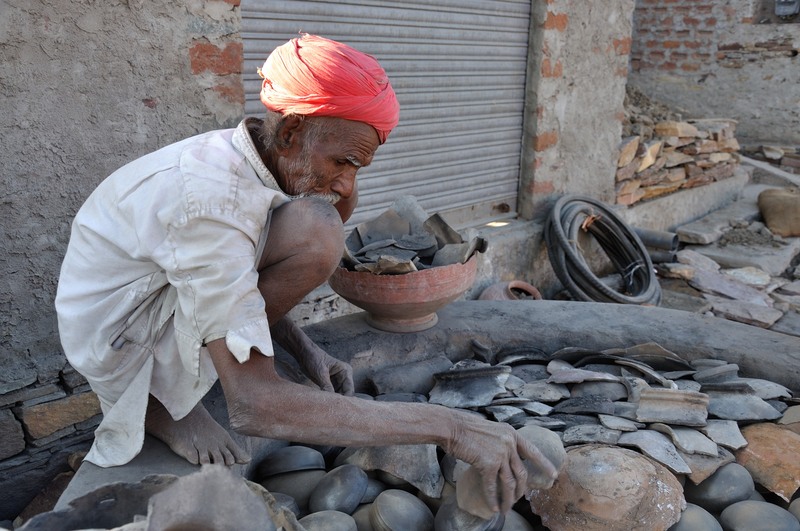 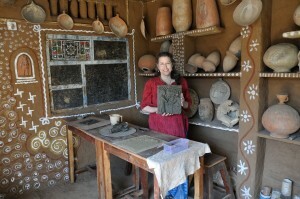 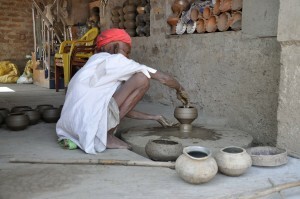 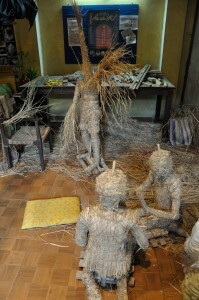 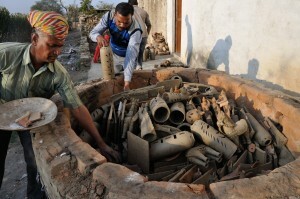 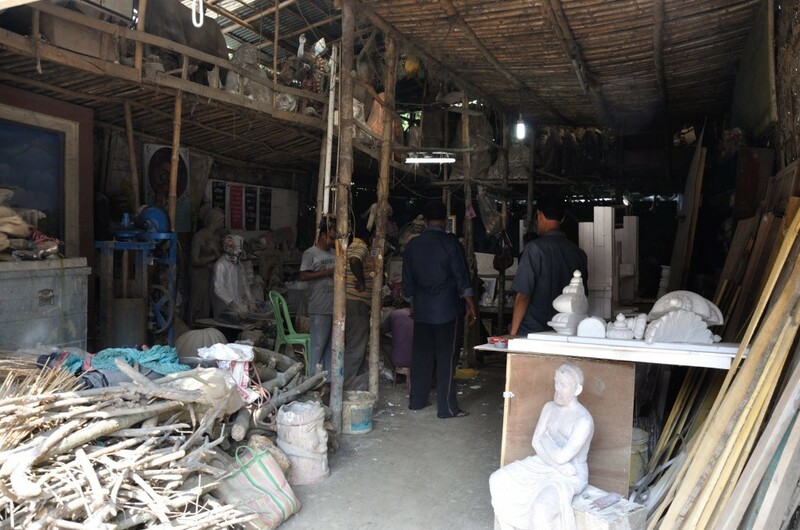 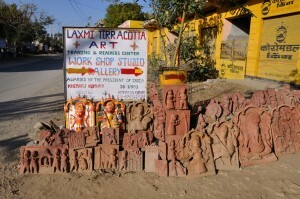 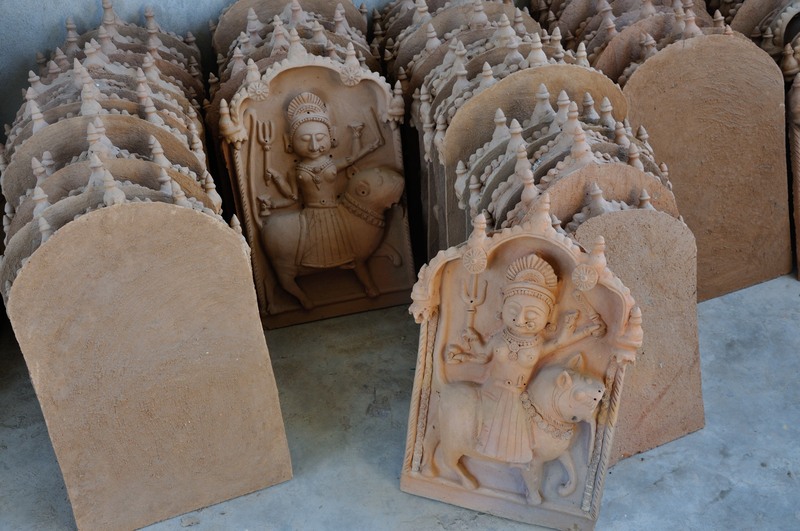 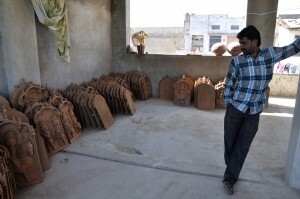 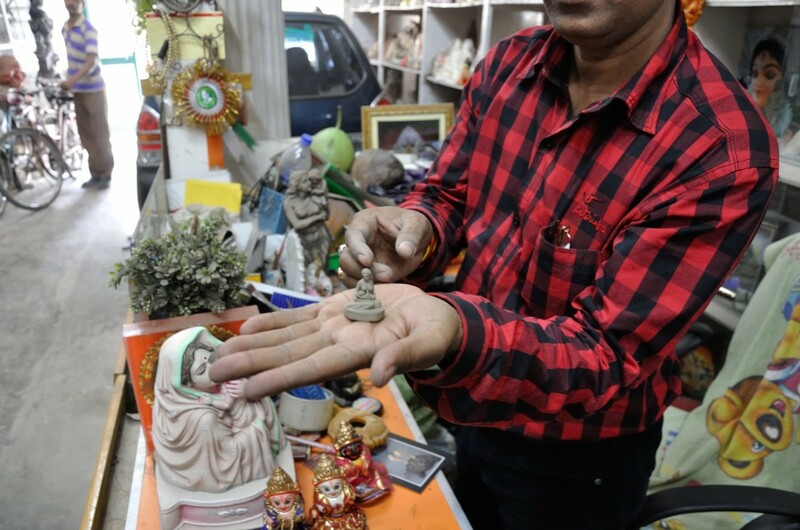 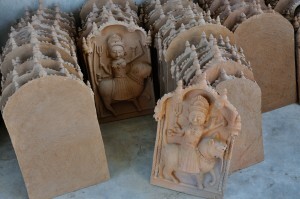 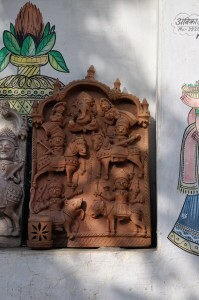 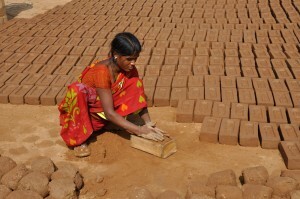 There are about 40 families in Molela producing terracotta sculpture. 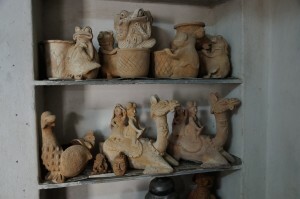 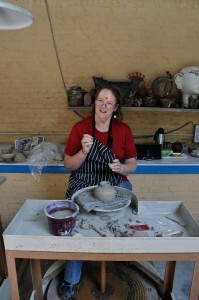 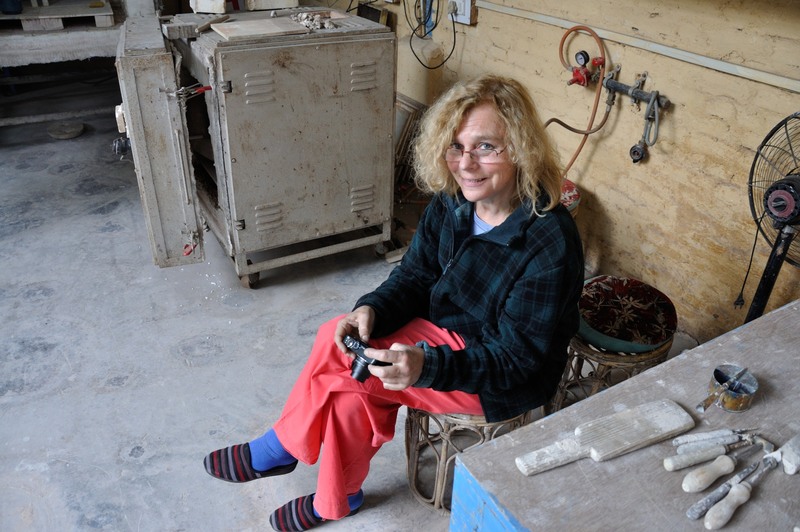 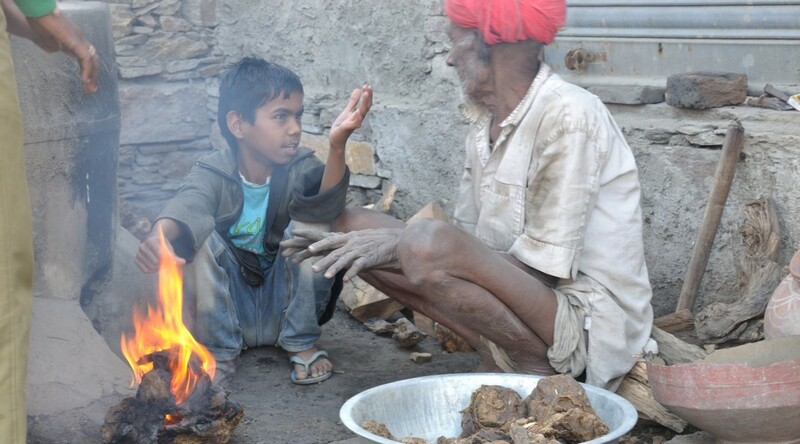 Only a few families are producing pottery. 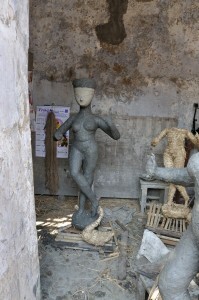 Each workshop has many works lined up outside to entice shoppers inside. 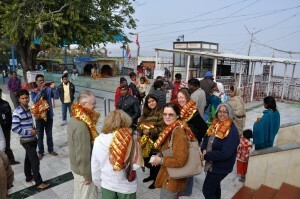 Tour buses stop here occasionally to shop and then continue on their journey. 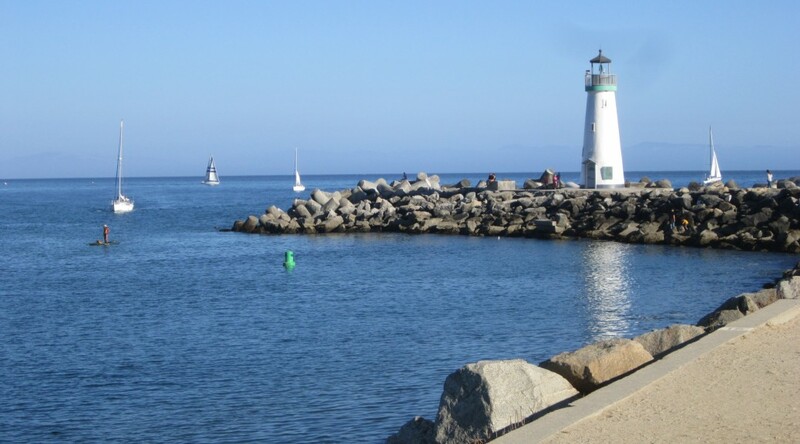 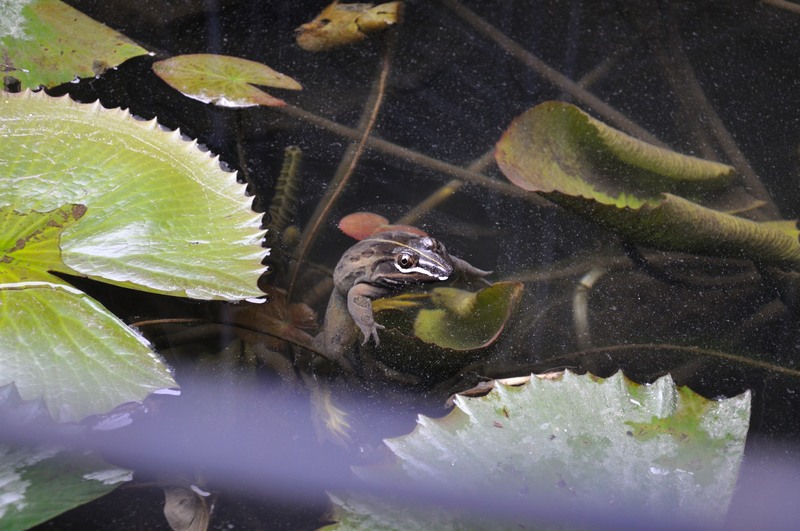 Just a few people like us stick around for a little while to get to know the place. 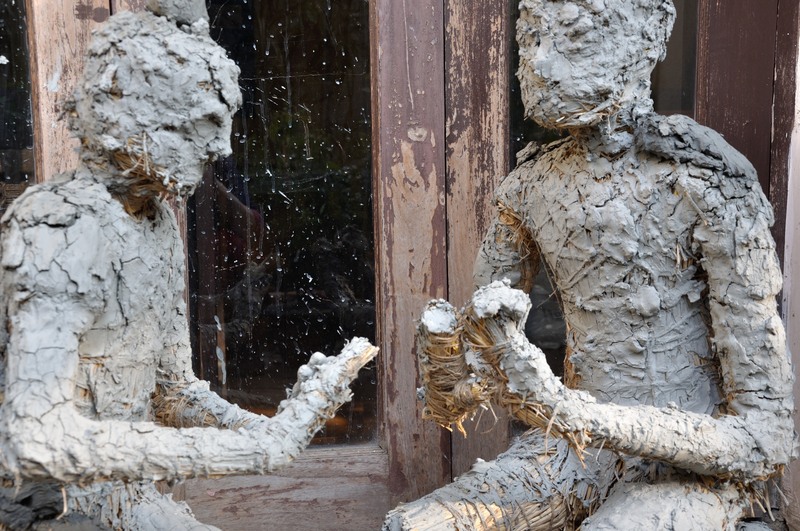 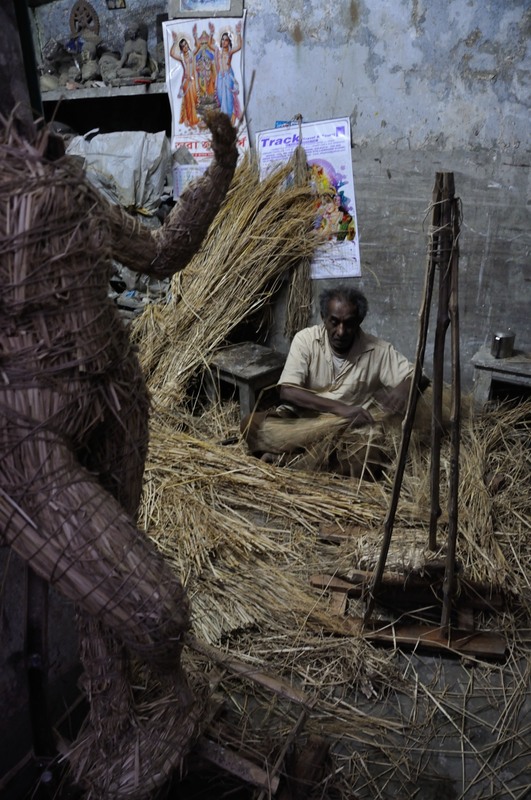 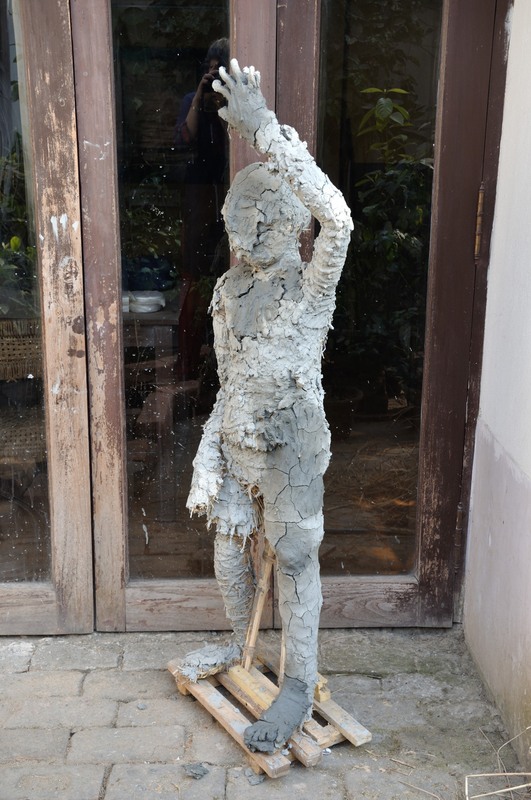 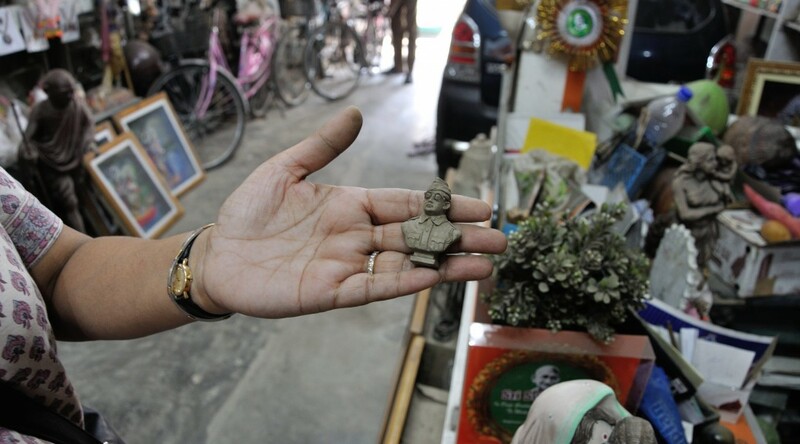 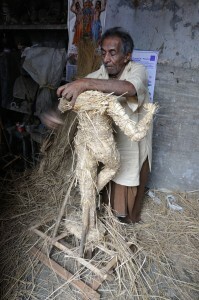 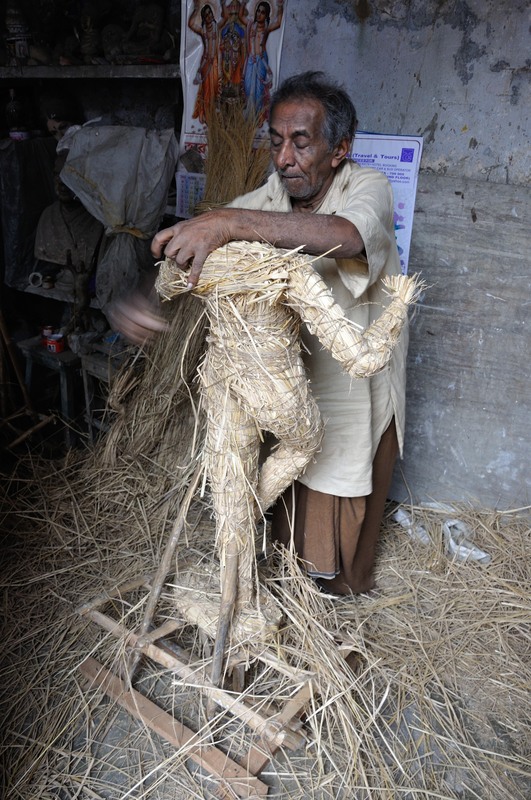 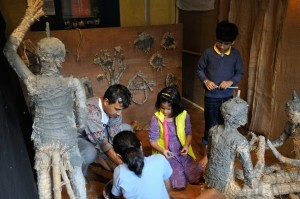 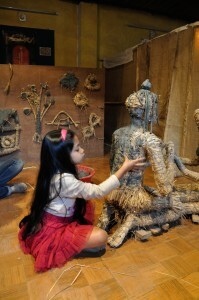 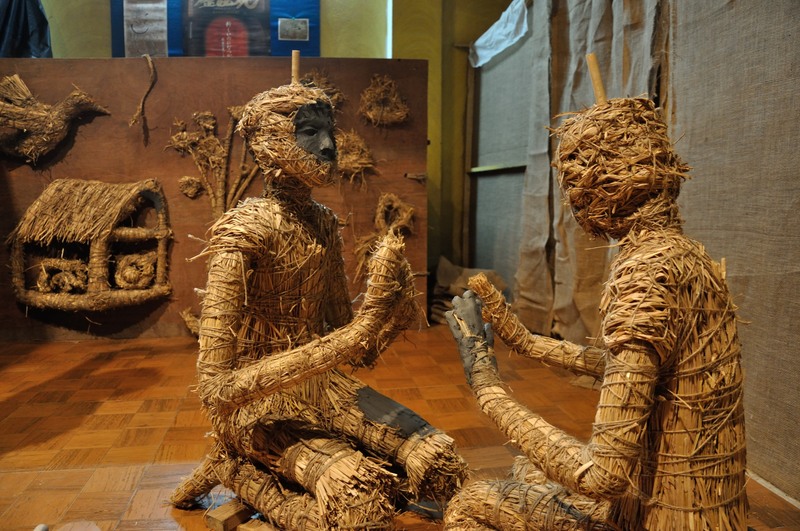 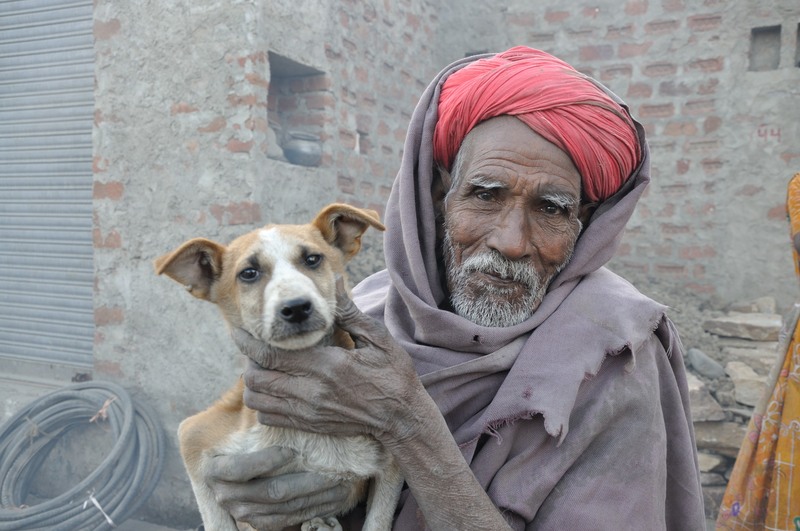 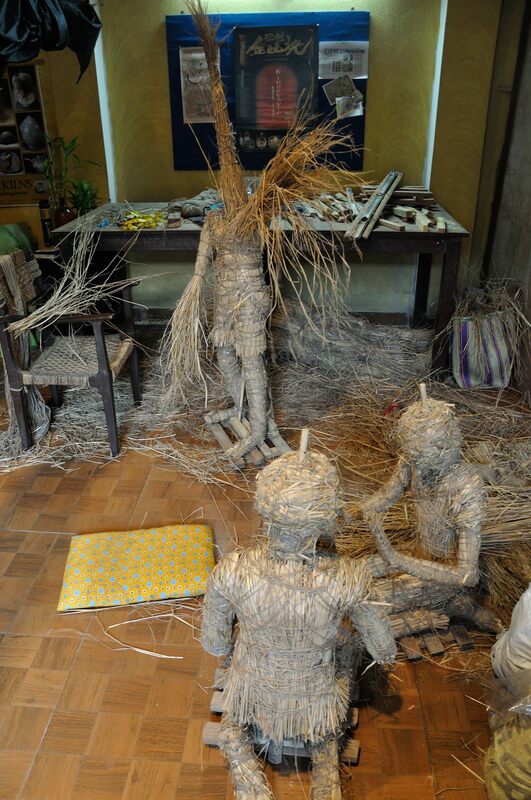 We spent a lot of time with one sculptor in particular, Shyam Lal. 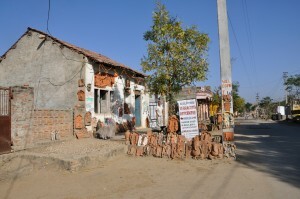 This is his storefront, followed by several images of his works. 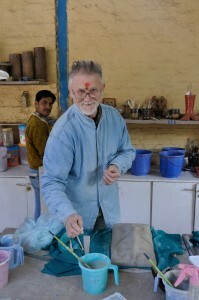 He had just finished a huge work segment and had many works ready for the beginning of what he called the buying season, meaning that over the next few weeks those tours buses that I mentioned before would be coming through en masse. 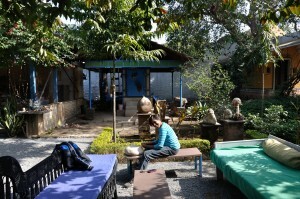 Now he was enjoying his vacation time, which he generously shared with us. 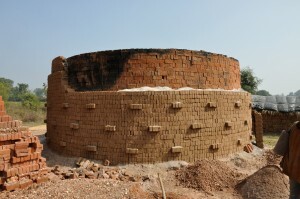 The forms are made using a combination of slabs and pinching. 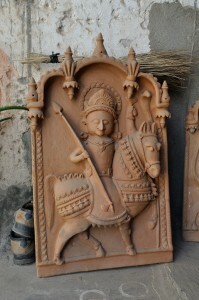 As many areas as possible are left open to encourage air circulation; examples in this piece are the crown and underneath the body of the horse. 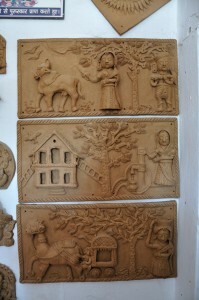 The finer details are made by impressing with tools, or by adding small pieces of clay. 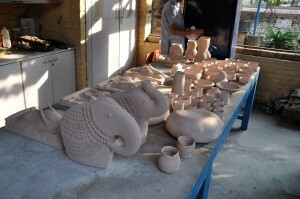 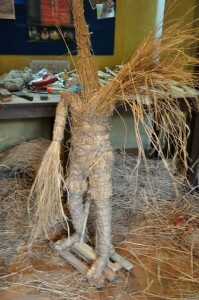 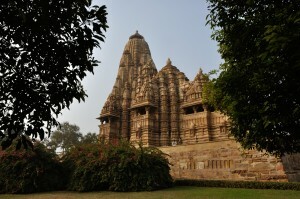 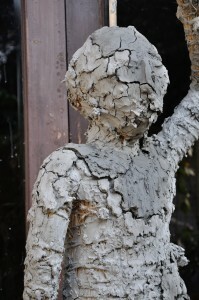 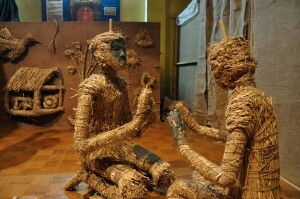 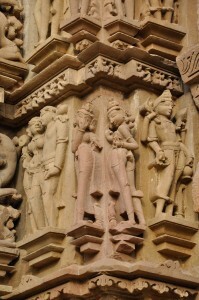 Cutting or carving into the clay would be difficult with the heavily fibrous consistency of the clay body. 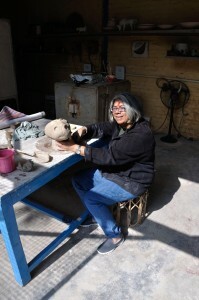 Gagan’s studio is wonderful. 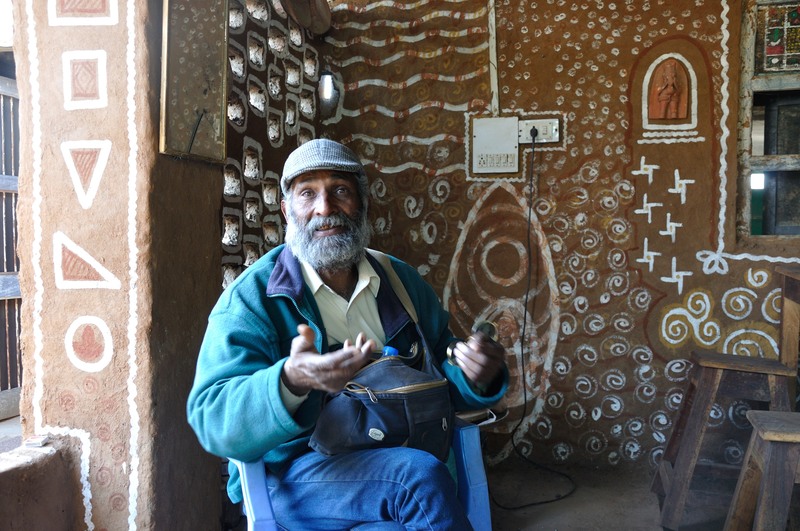 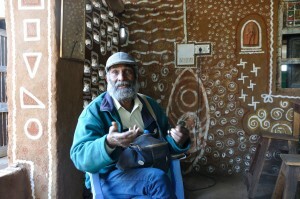 New designs are painted once a year on the clay-dung walls, and the studio is brimming with works that he has made and collected. 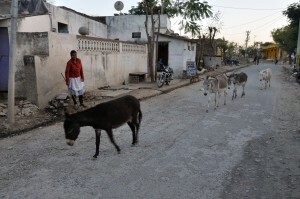 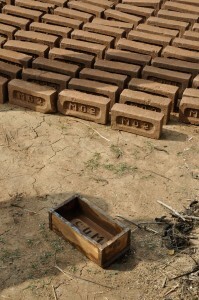 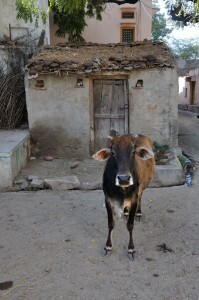 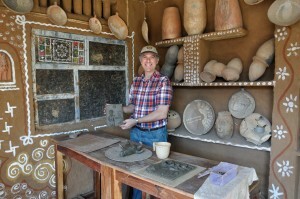 We experimented with the Molela clay, which contains at least one third donkey dung in the clay body. 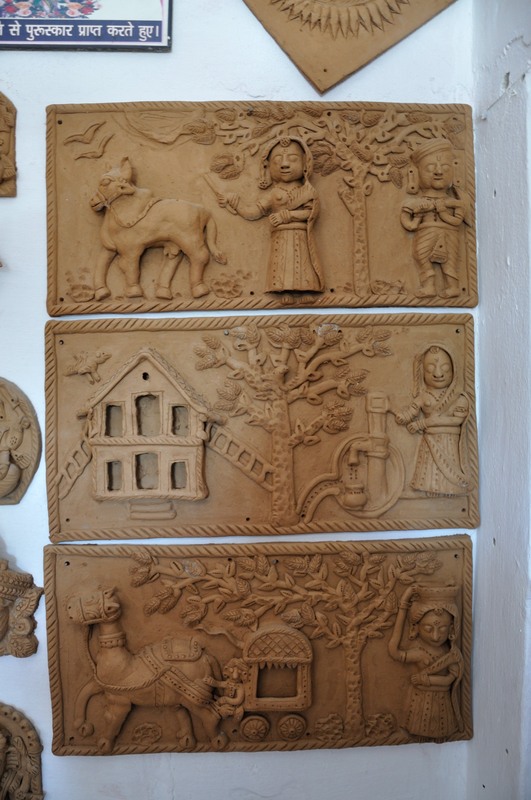 The donkey dung has an incredible amount of fiber in it, which gives the clay body not only the strength for making large plaques and tiles, but also for the extremely quick firings. 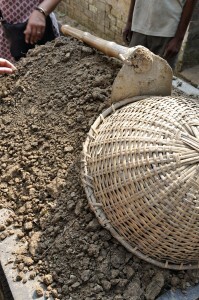 We were told that some firings are often finished in as little as three hours! 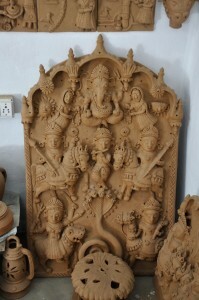 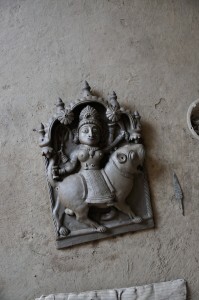 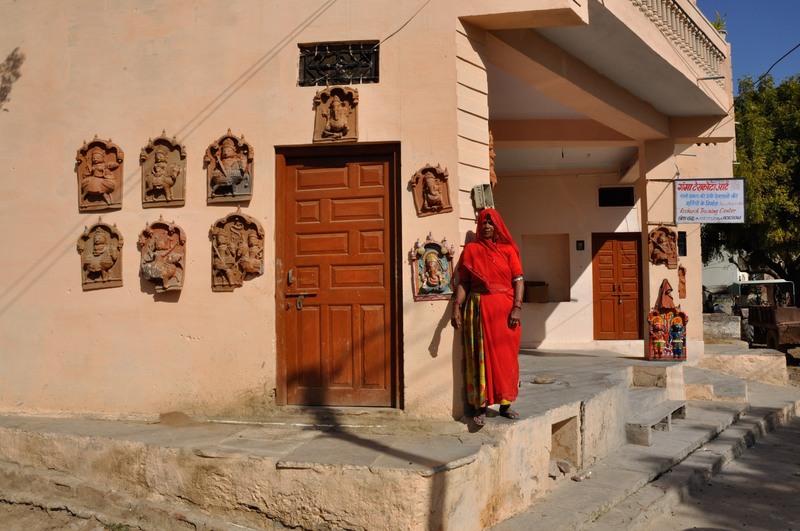 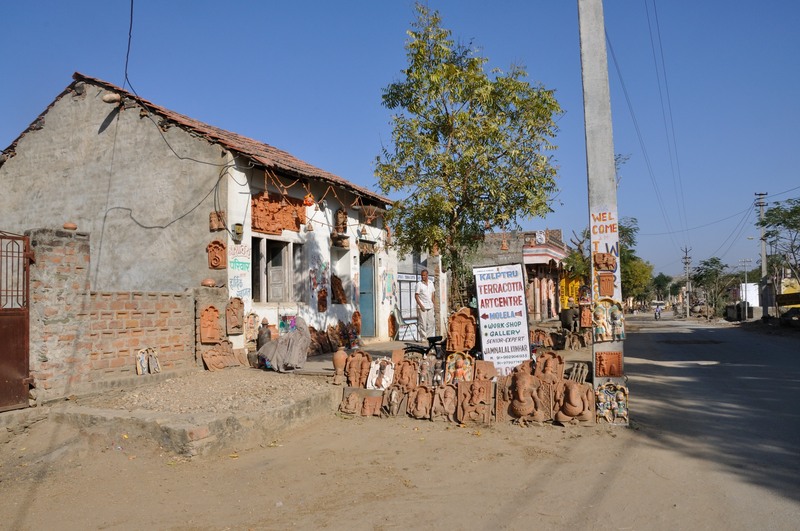 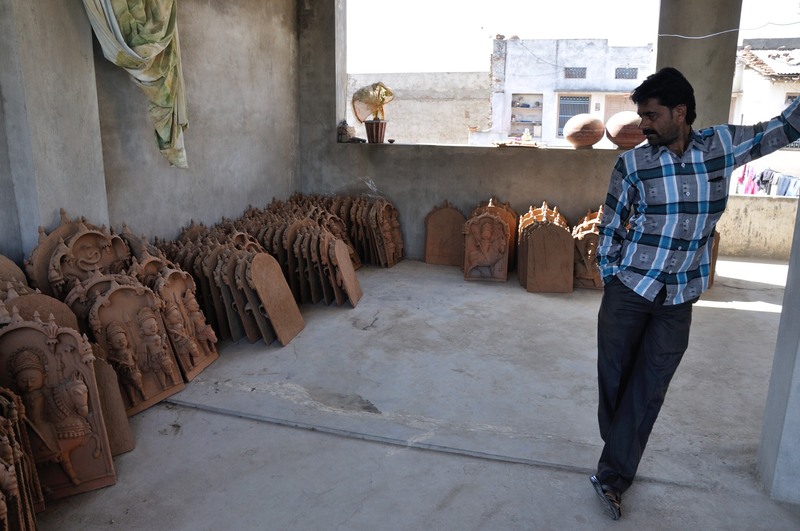 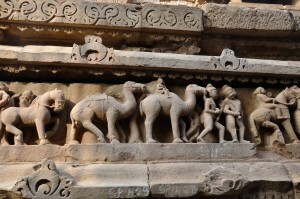 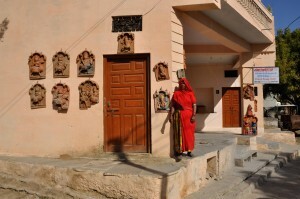 Before we left Molela for Nathdwara, we met another family loading their kiln, this time with sculptures, tiles and plaques, Jamnalal and Bharathi Kumhar of Kalptaru Terracotta Art Center. 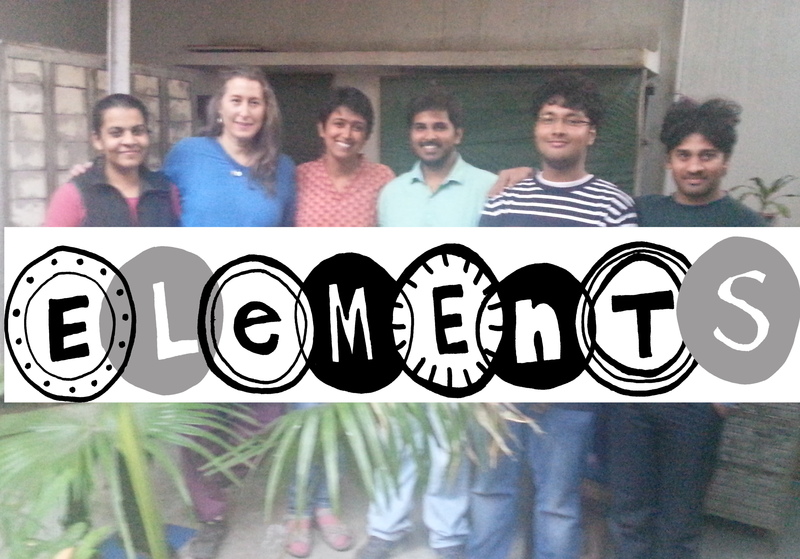 We joined in to help carry out the work for loading, and enjoyed the camaraderie that is universal when it comes to clay. 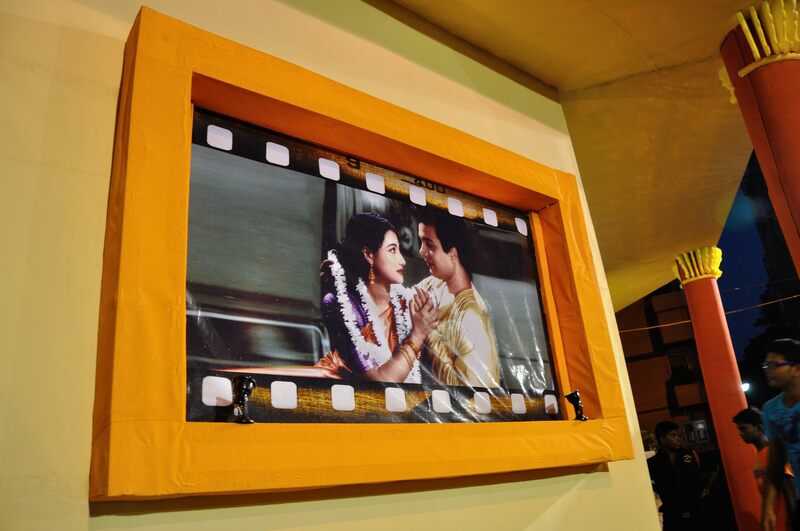 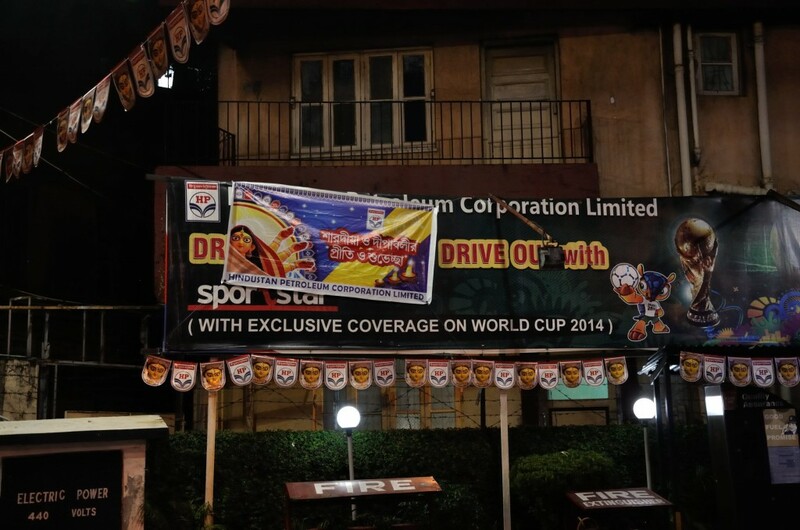 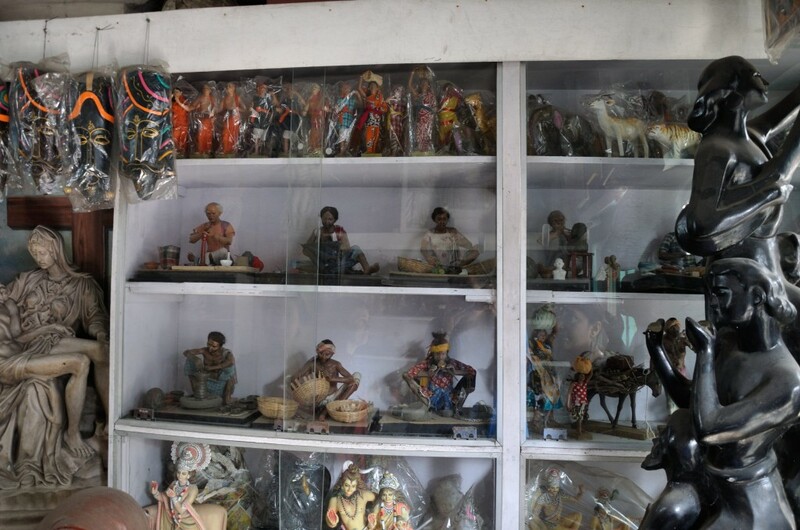 This is part of Jaminlal and Bharathi’s showroom. 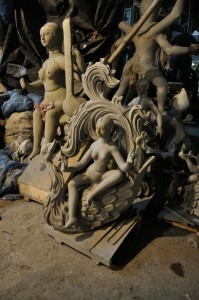 Very hard to choose from all the great pieces there! 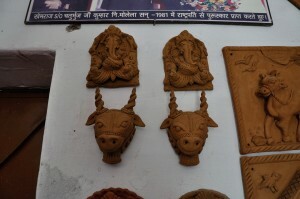 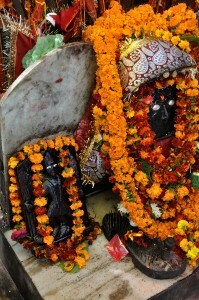 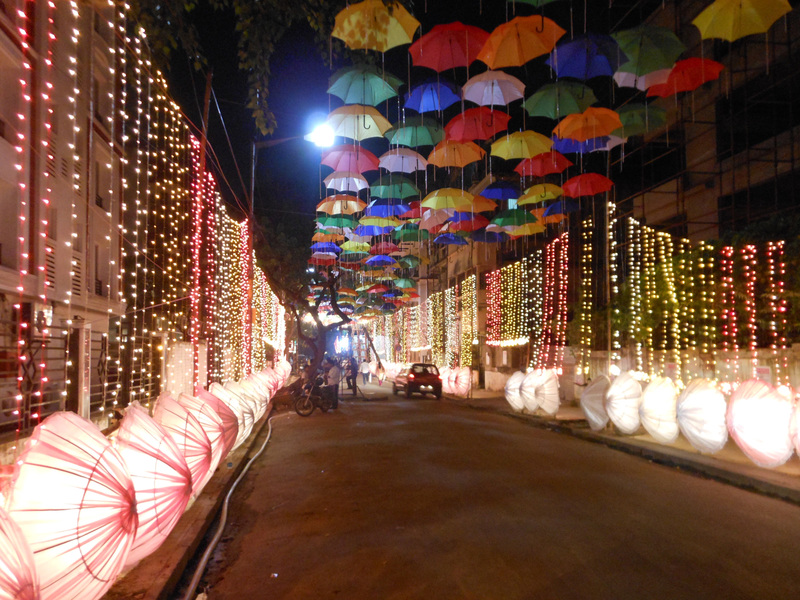 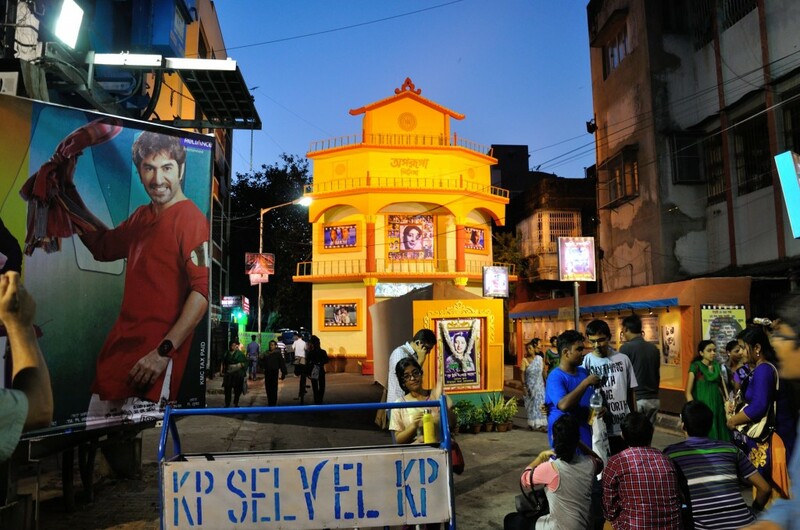 Nathdwara has a fantastic night market, nearby the Shrinathji Temple. The lane leading up to the temple gate had shops with wonderful looking sweets. 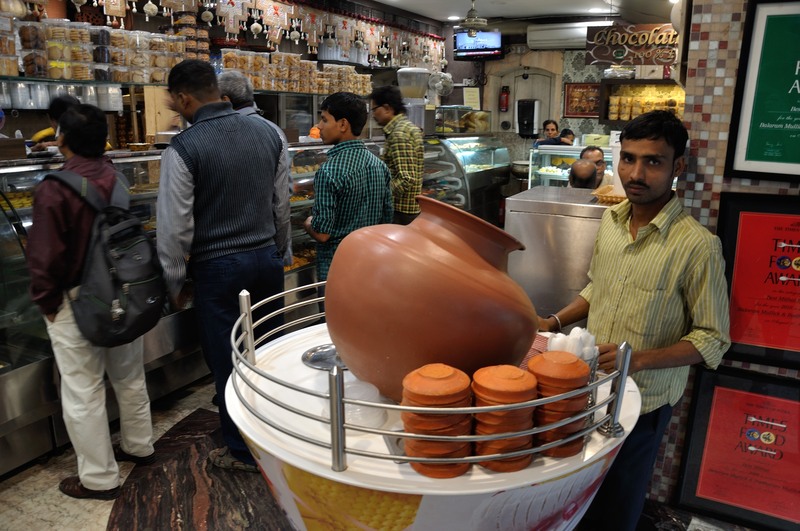 We were shocked by the size of the ladoos — about the size of a softball and nearly ten times larger than the ones at the shops in Kolkata. We bought one, and took two days to finish eating it! 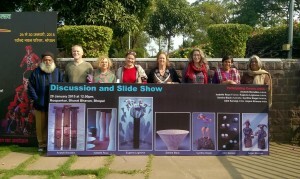 The next morning I gave a lecture at S.M.B. 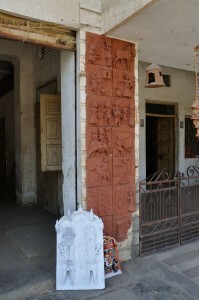 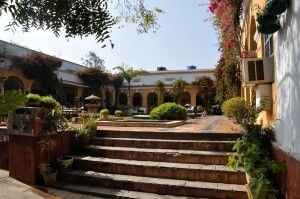 Government Post Graduate College in Nathdwara, where Gagan is a Professor of Art. 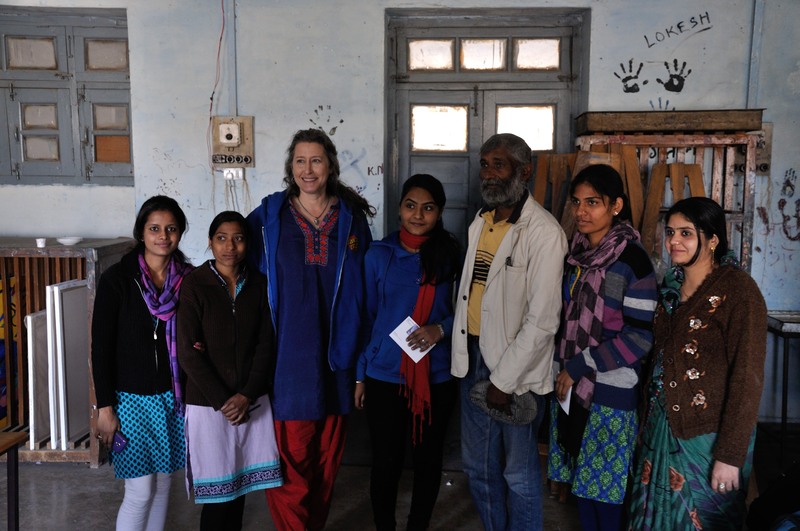 After my presentation I had the pleasure to spend time with his students and to learn about their interests and art processes. 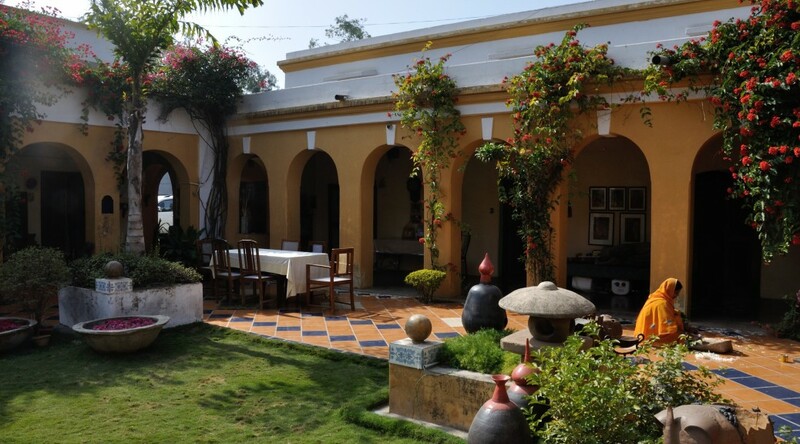 Back in Kolkata, Stan and I agreed that of all of the great memories that we brought back from this trip to Rajasthan, visiting Molela and Nathdwara is at the top of our list. 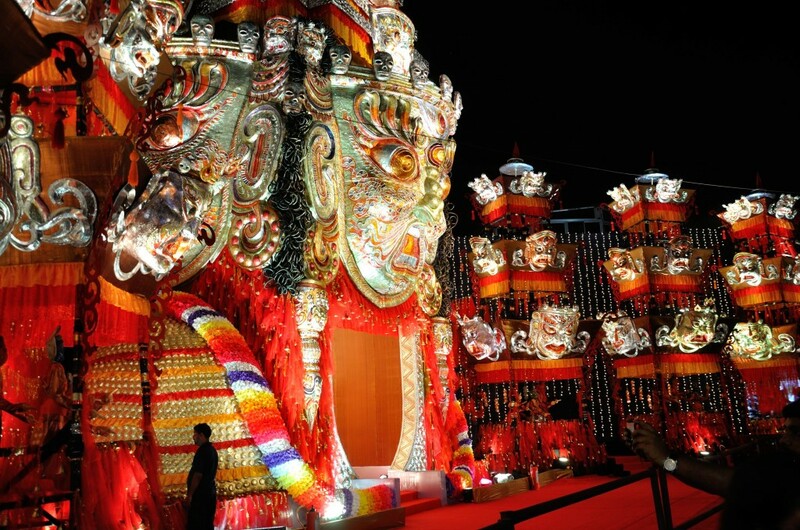 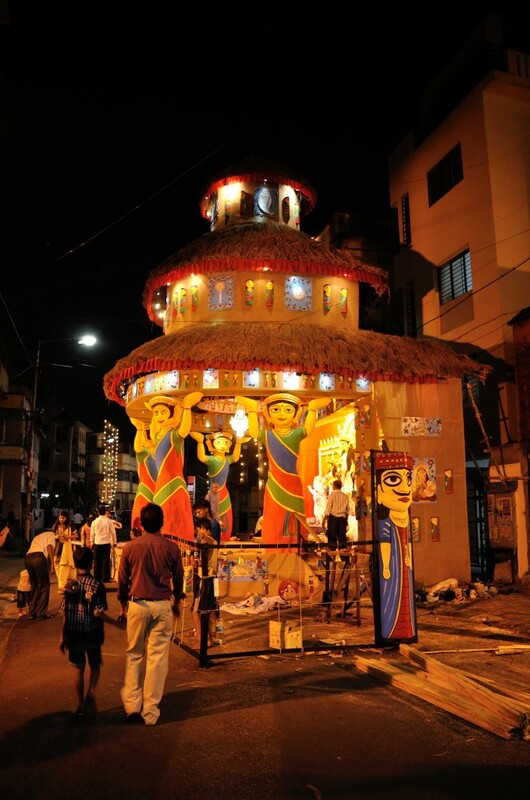 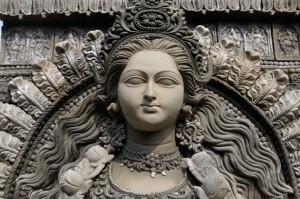 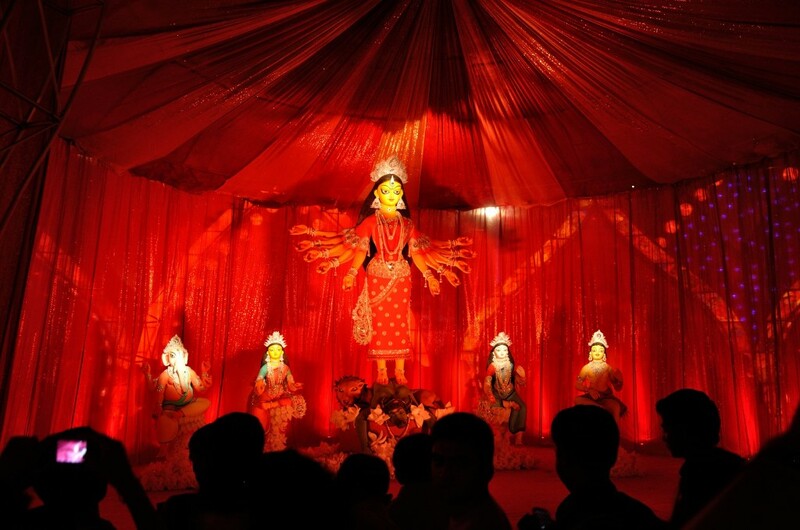 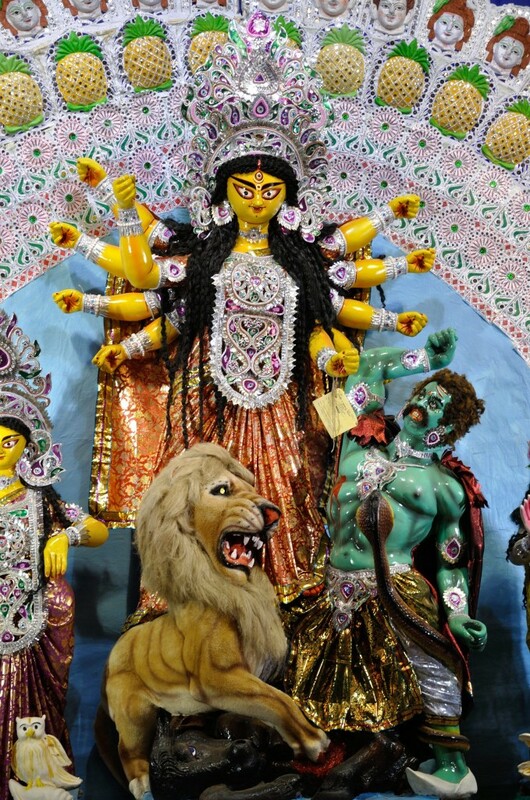 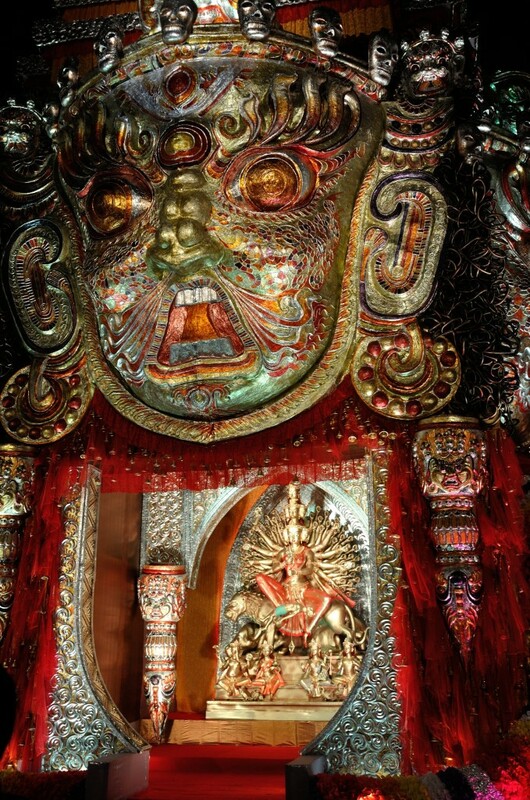 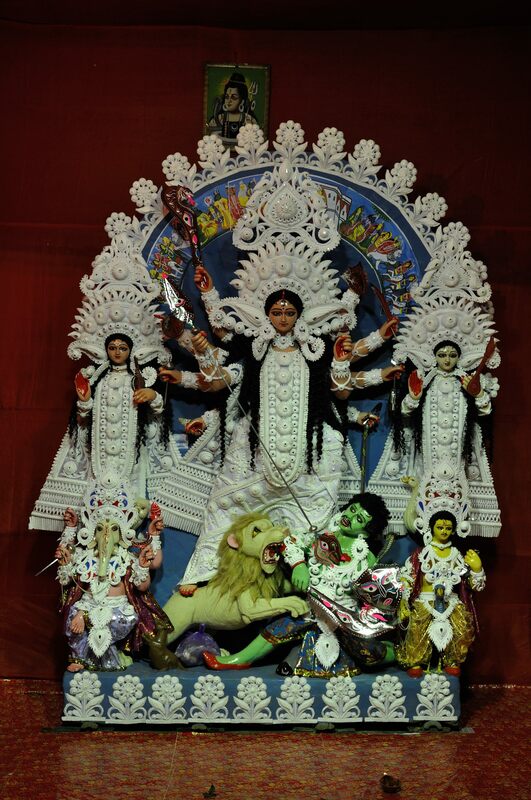 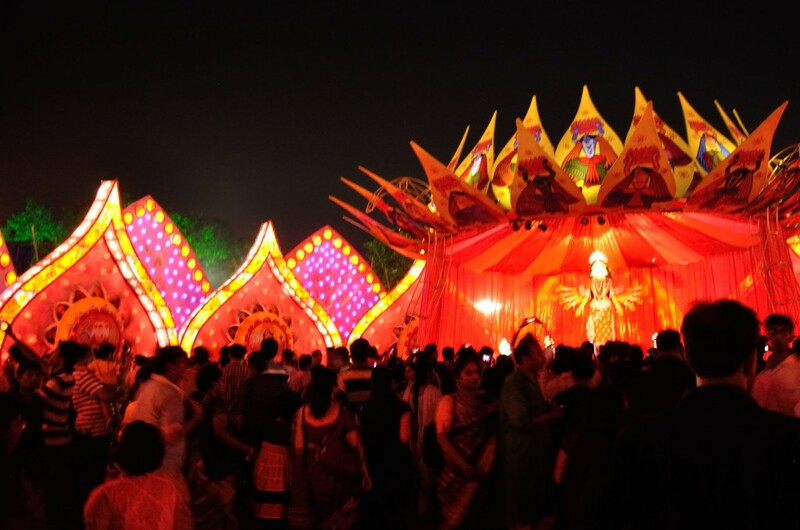 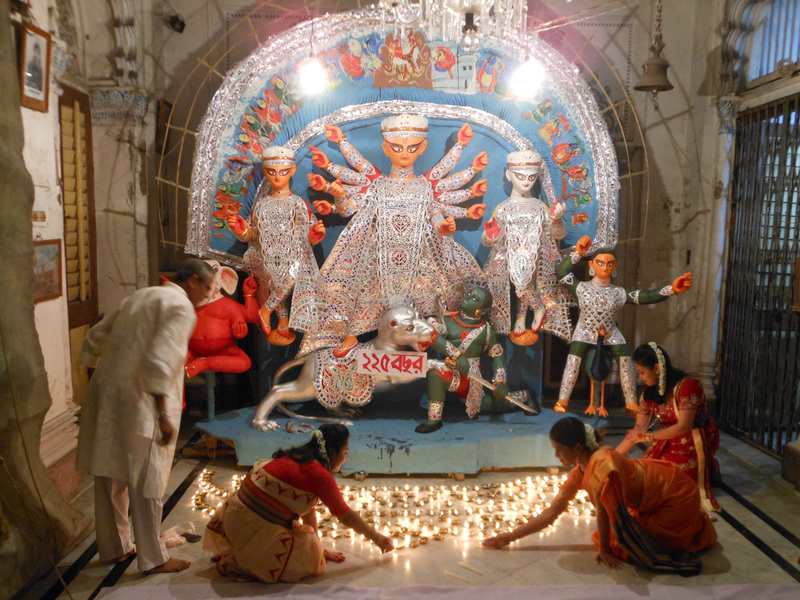 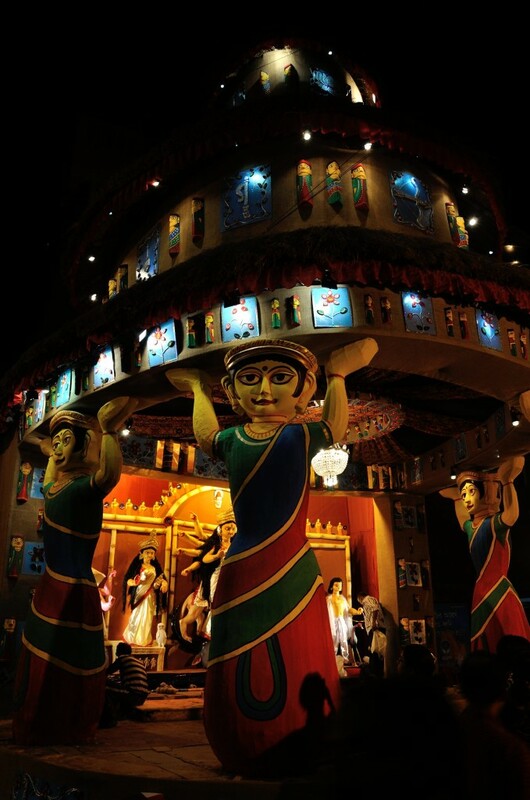 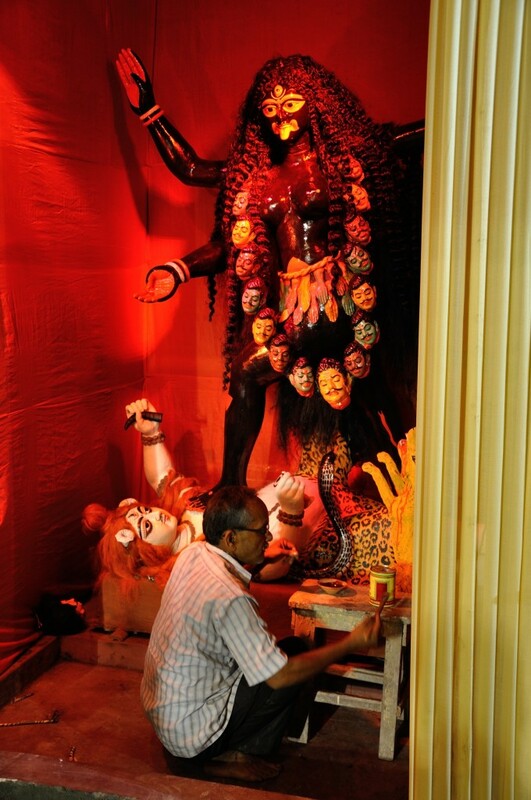 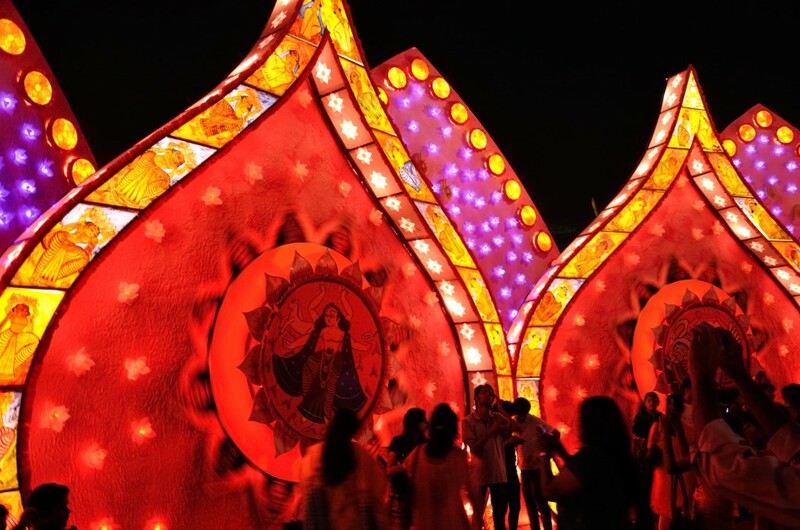 The countdown to Durga Puja is well underway by Mahalaya, which is observed seven days before (September 23rd for 2014). It’s on Mahalaya that preparations for Durga Puja reach their final stages, and it’s believed that on this day Durga, the goddess of supreme power, descends to earth. 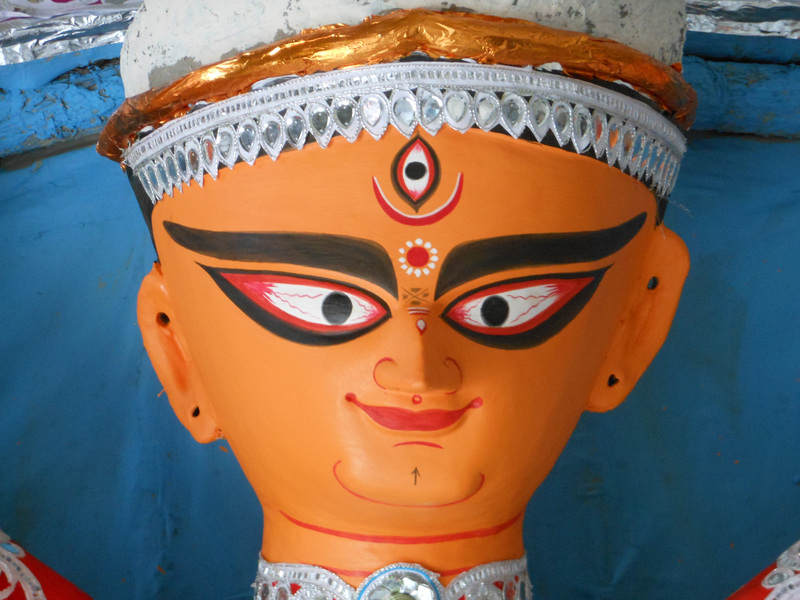 One older custom still observed by some is the painting of Durga’s eyes on this day, as a symbol of her invocation and impending presence. 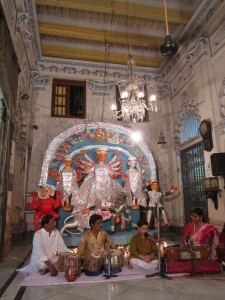 On Mahalaya, my husband Stan and I paid an early morning visit to the Shovabazar Rajbari. 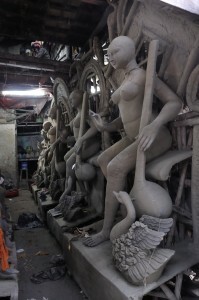 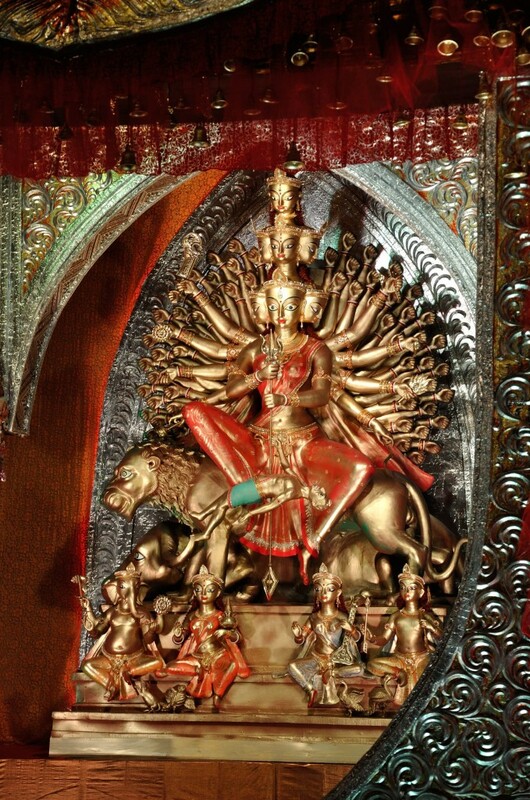 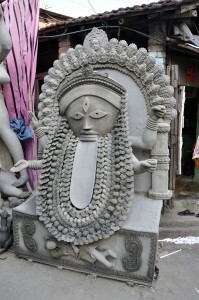 Dilipda’s Durga sculptural tableauxl had been painted and dressed, but final details, such as hair and weapons or instruments that the gods and goddess hold in their hands, have not yet been added. 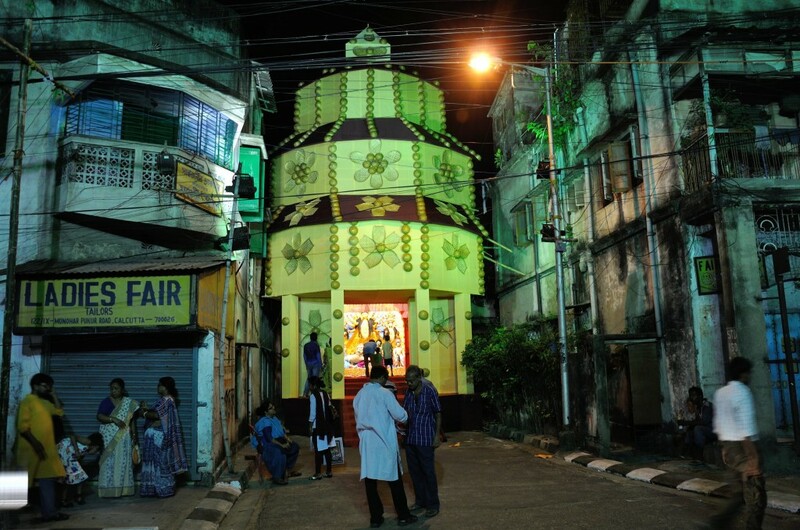 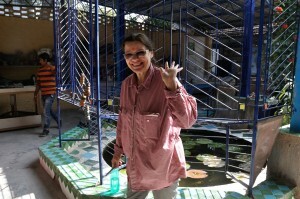 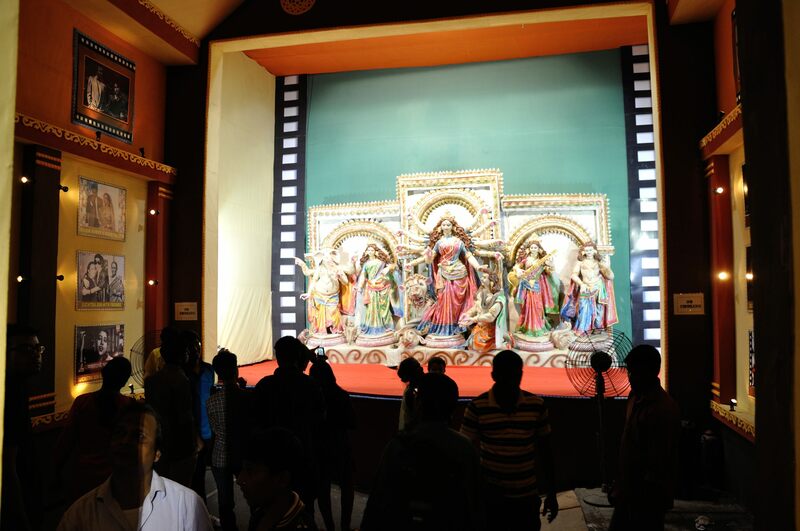 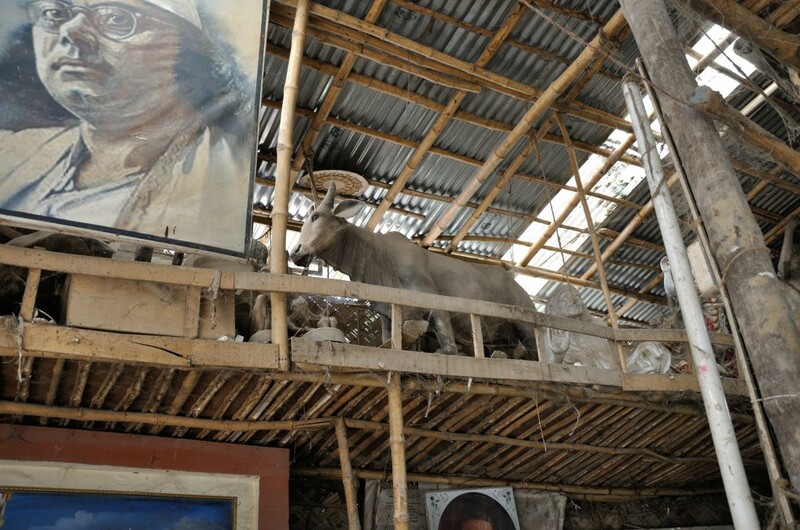 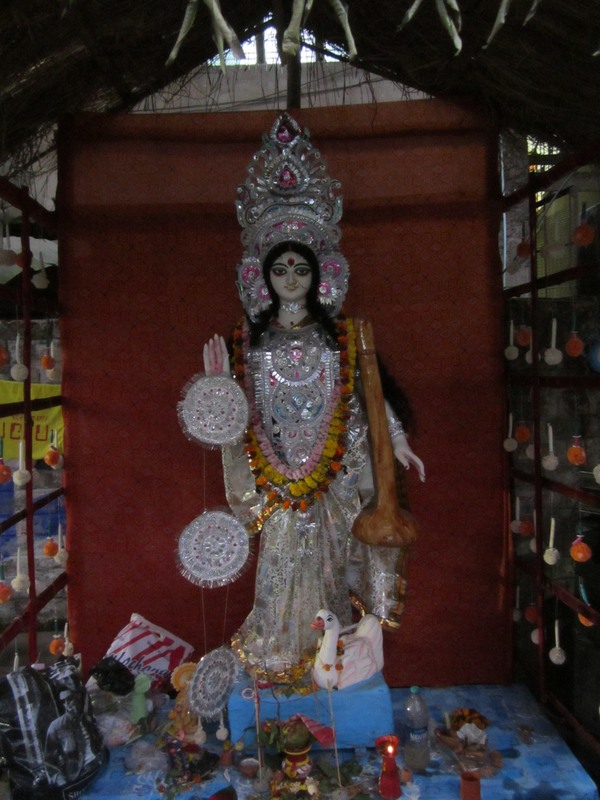 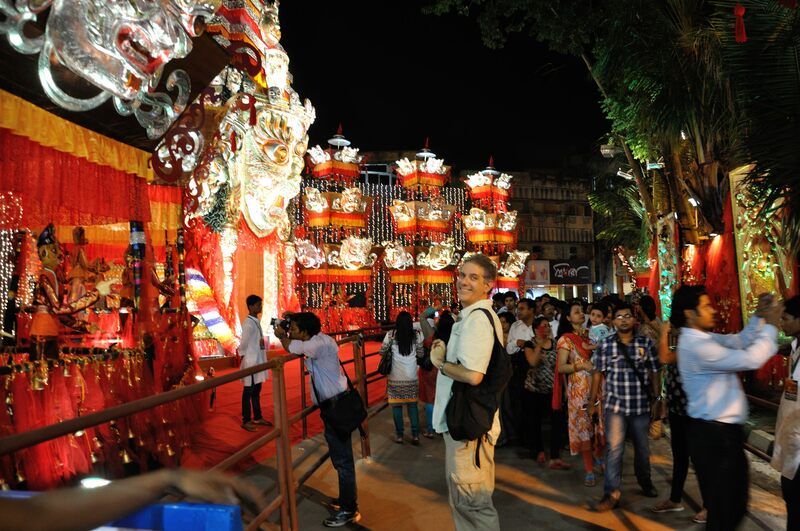 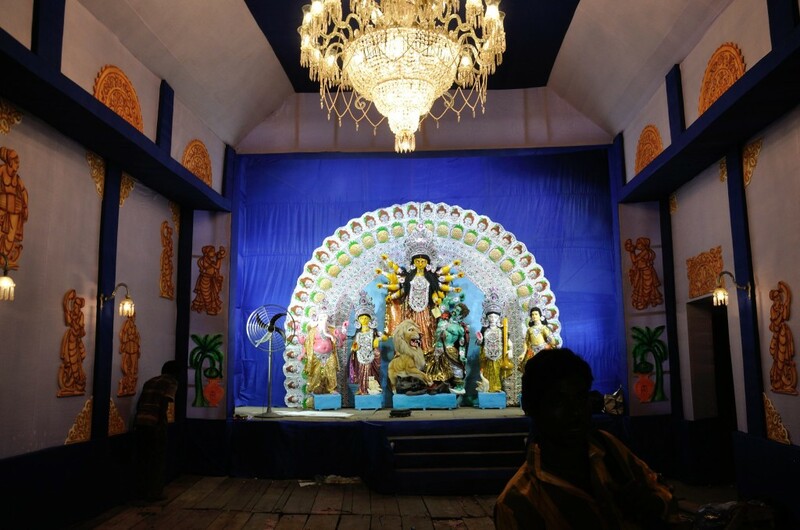 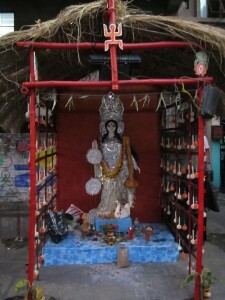 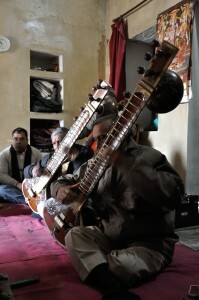 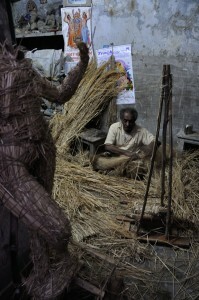 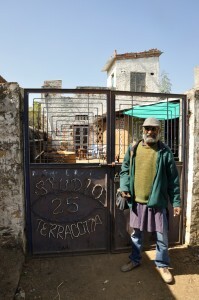 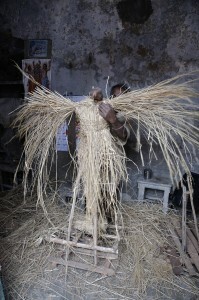 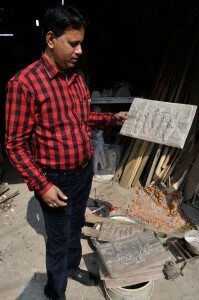 While we were there, we encountered Sri Krishna Deb, the community organizer for the Shovabazar’s pandal presentation. 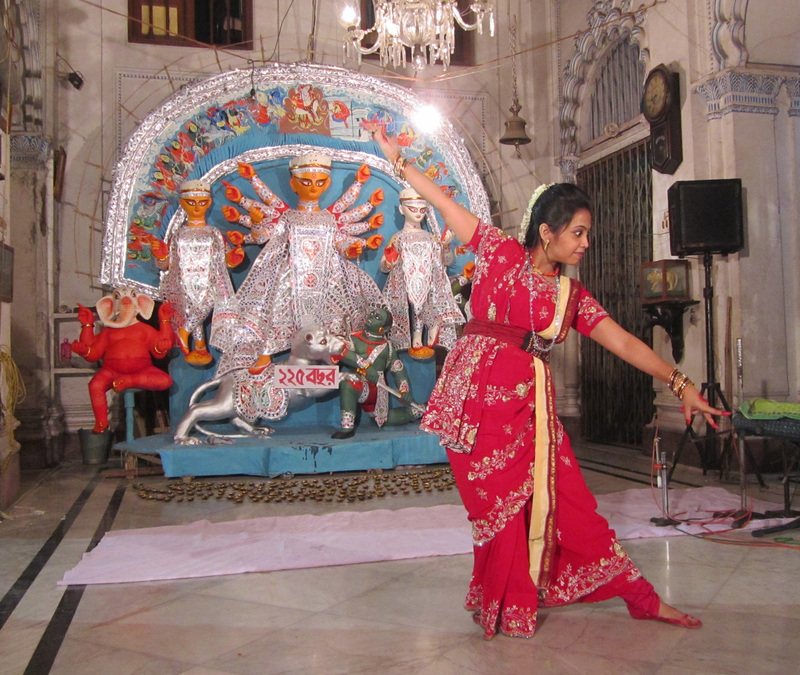 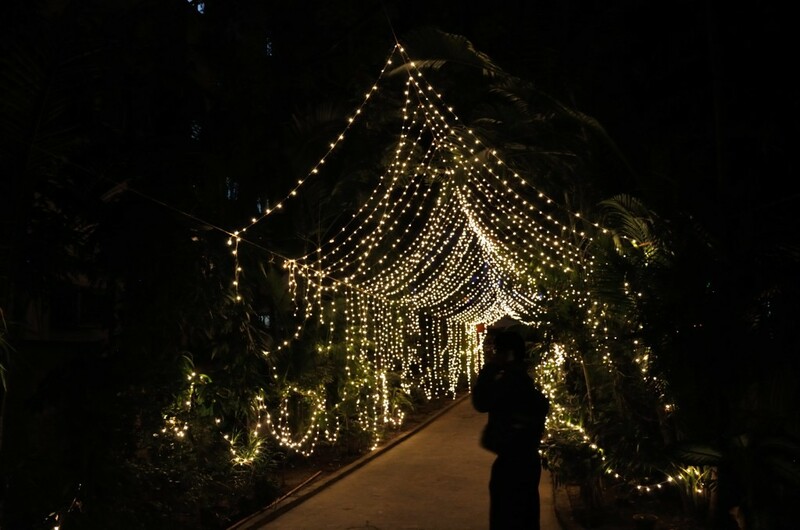 Sri Deb graciously invited us to attend the community’s Mahalaya celebrations that evening! 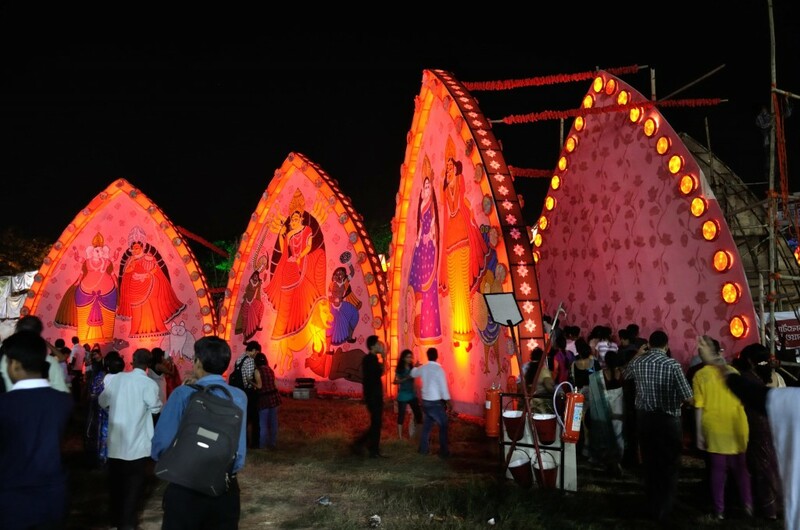 When we returned in the evening, the celebration was getting underway with a beautiful ceremony in which many small oil-filled clay dishes were lit. 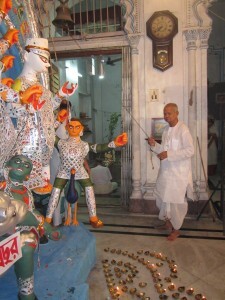 After the lamps were lit, Sri Deb rang the puja bell. 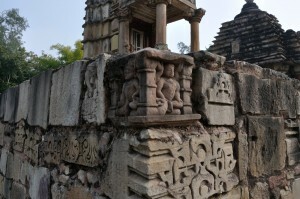 Far in the distance (center of the photograph) you can see a priest sitting on the ground and performing the evening’s rites. 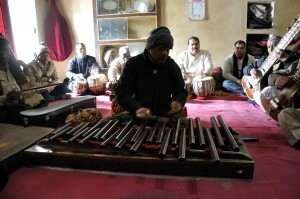 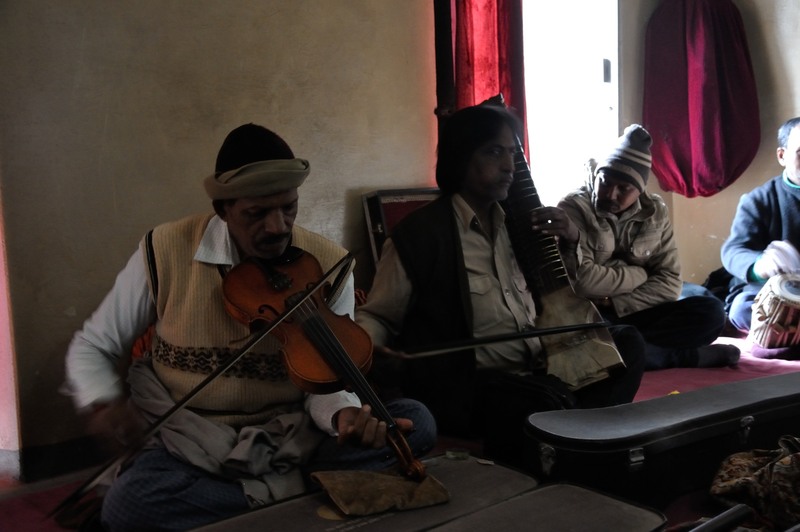 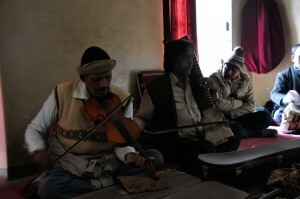 Then began a lovely musical program including members throughout the Shovabazar community, beginning with the youngest members, and progressing to the most accomplished dancers and musicians.